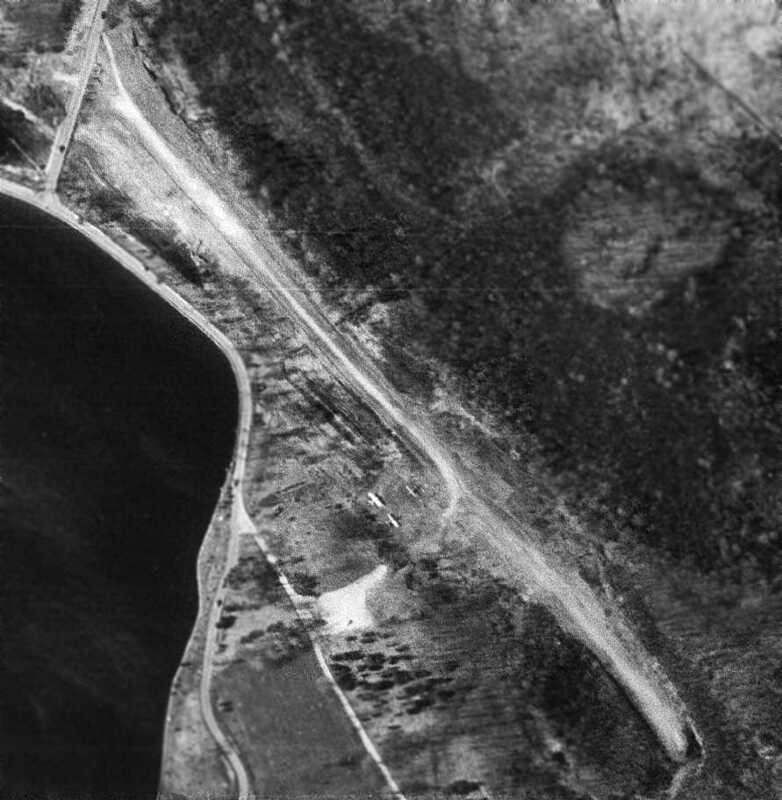 A 1938 aerial view looking north at Bayside Airport (courtesy of Roger Pinel). as it was not yet depicted on the August 1935 Boston Sectional Chart. Bayside Airport was built by Peter Bradley to serve his enterprises, including his fertilizer plant directly across the water in Weymouth. showing 6 single-engine planes & a small office around a grass airfield. A circa 1930s photo (from the John P. Richardson Collection, Hingham Historical Society & Town of Hingham) of a ski-equipped Fleet biplane behind a horse-drawn sleigh at a snowy Bayside Airport. which depicted Bayside as a commercial/municipal airport. No depictions have been located of Bayside Airport on USGS topo maps. Unfortunately Bayside Airport had an extremely short lifespan. as it was no longer depicted on the May 1941 Boston Sectional Chart. urgently needed to mass-produce destroyer escorts for WW2. 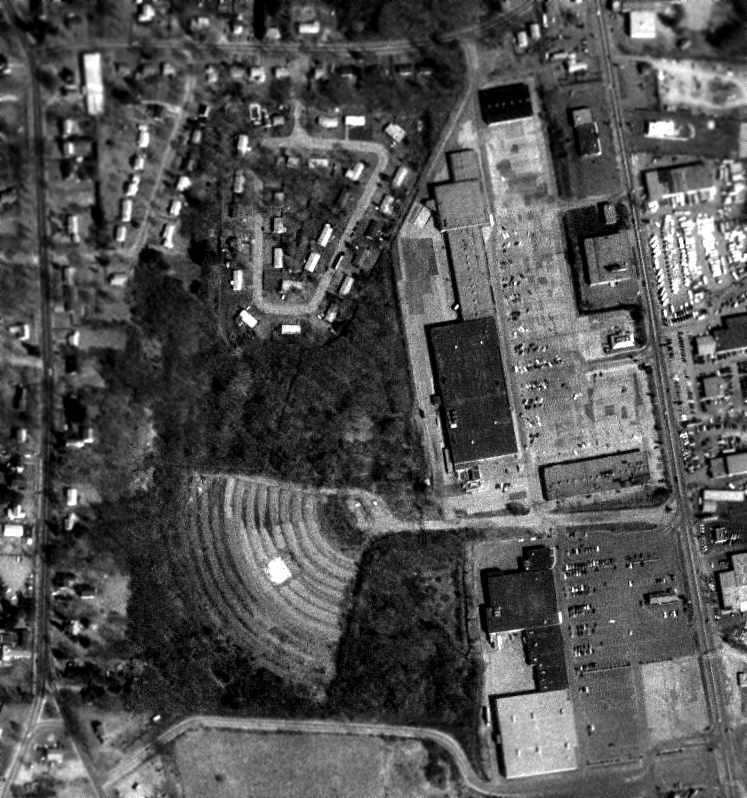 with the lace traces of the airport possibly visible at left, with the site being covered by construction of Bethlehem Hingham Shipbuilding. During the 3.5 years that the yard was operational, Bethlehem Hingham Shipbuilding produced 277 ships, ending operations in 1945. 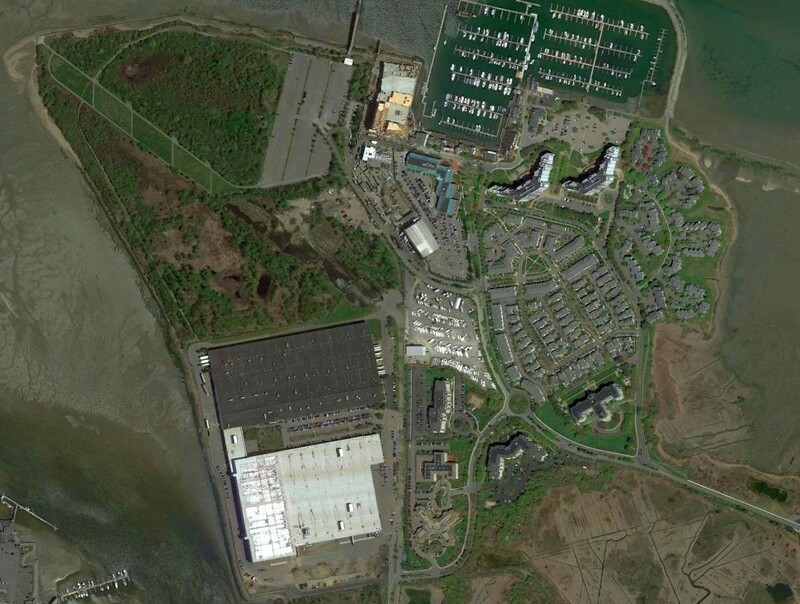 An 8/24/13 aerial view showed no trace remaining of Bayside Airport. and the marina upgraded & several thousand apartments have been erected. The site of Bayside Airport is located north of the intersection of Shipyard Drive & Essington Drive. Thanks to Roger Pinel for pointing out this airfield. A 1952 photo of Malcolm Woronoff & Arnold Stymest (Braintree Airport's first manager) standing underneath a Piper TriPacer at Braintree Airport. 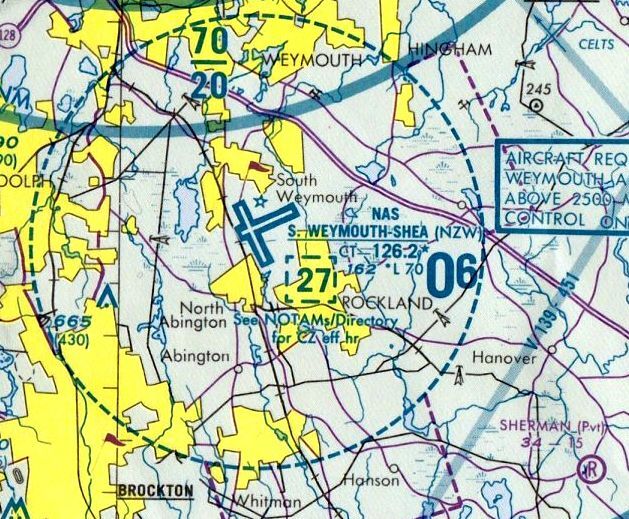 Braintree Airport, “in the western part of town near Great Pond”, was “created shortly after World War II by a group of young aviators. avoiding most of that conflict's fighting but learning to fly in pilot school & going on to serve in the Air National Guard. "Money was scarce but youth & hard labor soon developed a flying field that allowed them to land their planes safely." making the runway longer & wider & attracting more than 100 South Shore residents to the association. 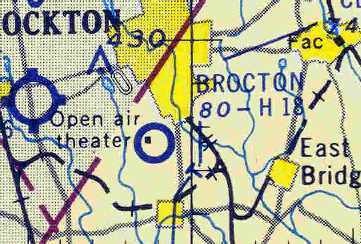 Braintree Airport was not yet depicted at all on the July 1946 Boston Sectional Chart (or subsequent Sectionals through 1959). was a 1952 photo of Malcolm Woronoff & Arnold Stymest (the first manager of Braintree Airport) standing underneath a Piper TriPacer. A 1952 photo of a Piper TriPacer taking off from Braintree (courtesy of Ed Francis), with several other single-engine aircraft parked on the field. 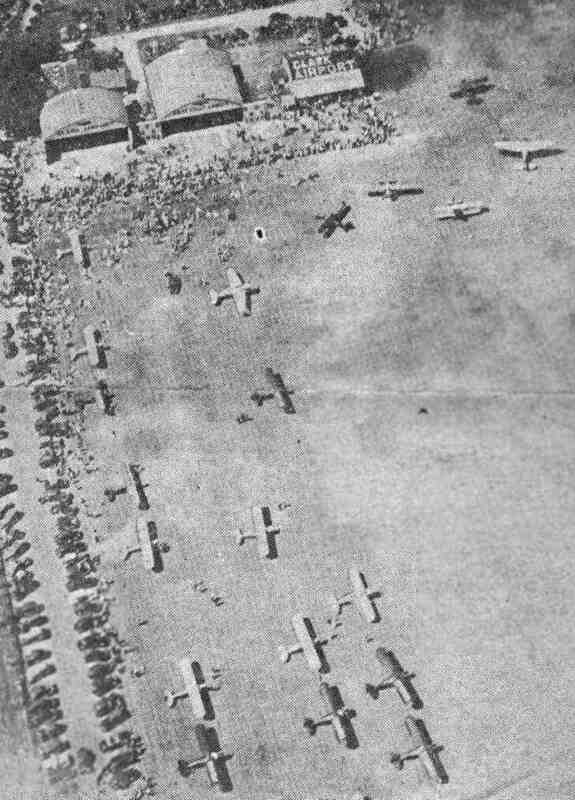 A circa 1952 photo of a large number of general aviation aircraft at Braintree Airport (courtesy of Ed Francis), including a surplus AT-6 Texan. 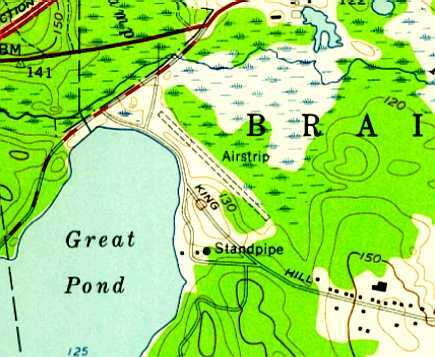 Braintree Airport was not yet depicted at all on the 1954 USGS topo map. 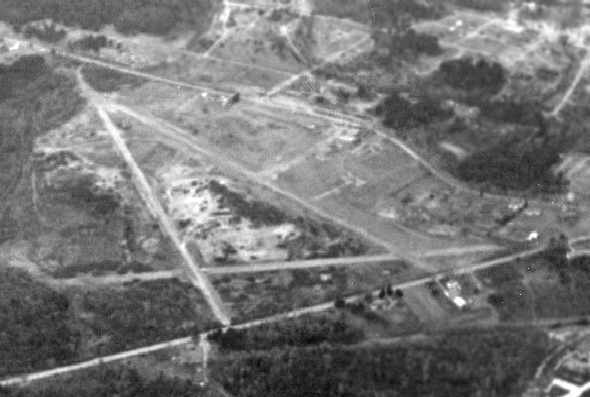 A 4/27/57 USGS aerial photo (courtesy of Ed Francis) depicted Braintree Airport as having an unpaved southeast/northwest runway. 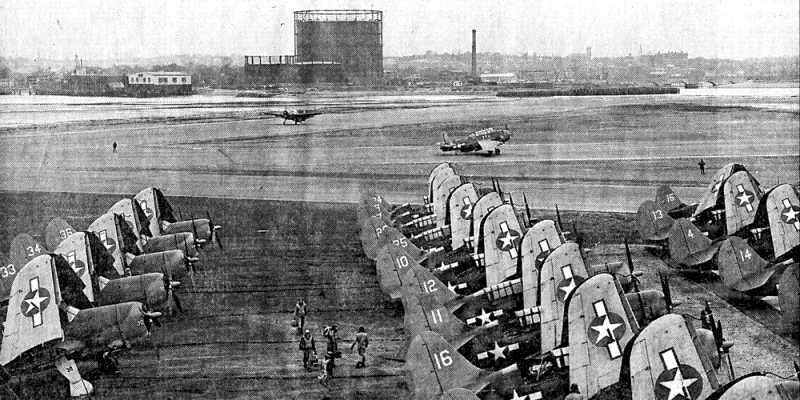 There were no buildings evident at the airfield, but note the 3 single-engine aircraft parked on the west side. 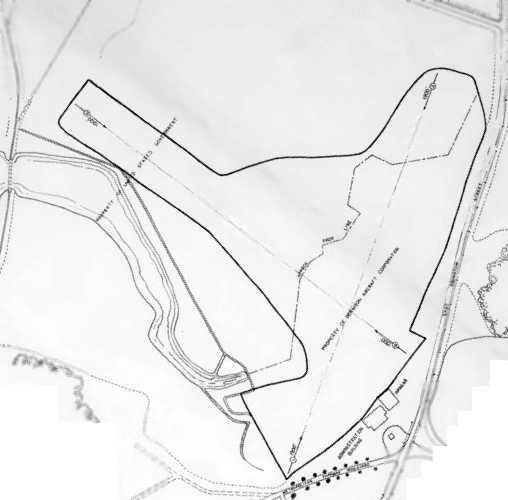 The 1958 USGS topo map (courtesy of Ed Francis) depicted Braintree Airport as an unpaved southeast/northwest runway, labeled simply as “Airstrip”. 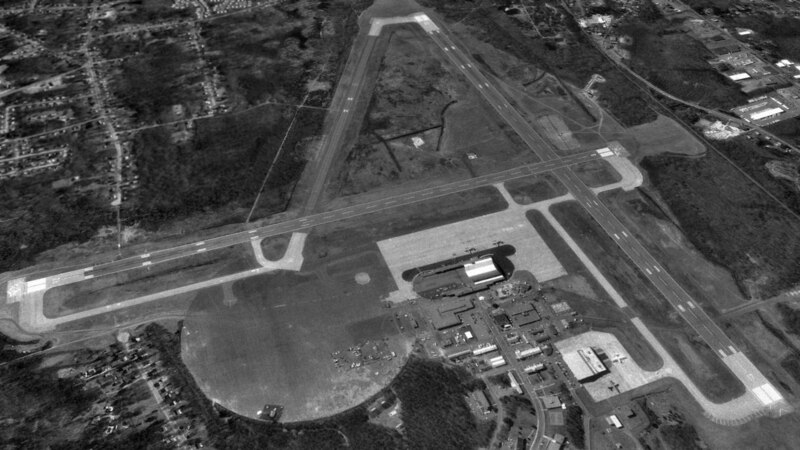 An undated aerial view of Braintree Airport, showing a single unpaved runway. 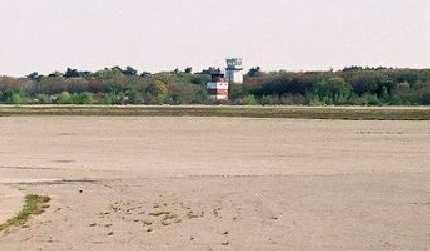 There were no aircraft visible, so the picture may have been taken after the airport's closure. 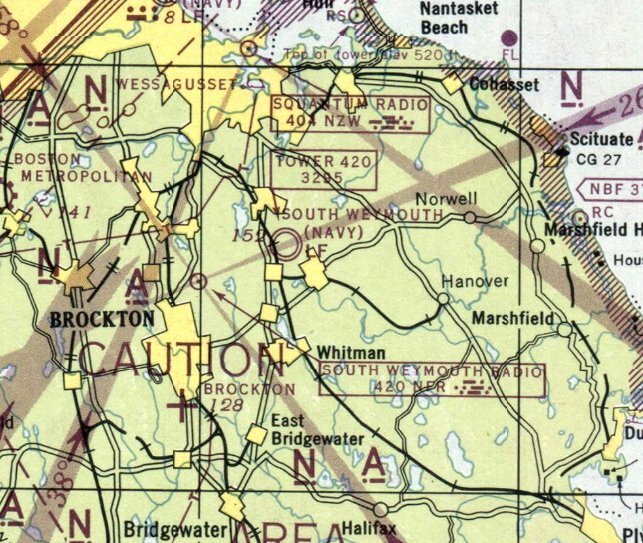 Braintree Airport was not depicted on the May 1959 Boston Sectional Chart (courtesy of Ron Plante). clearing trees at the west end of the site & lengthening the runway another 200'. 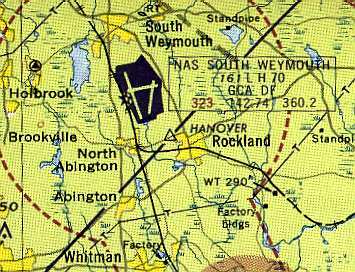 The only aeronautical chart depiction which has been located of Braintree Airport was on the November 1960 Boston Sectional Chart. 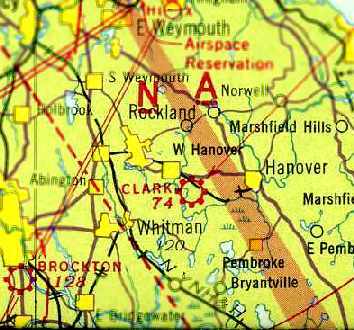 It depicted Braintree as a private airfield having a 2,800' unpaved runway. despite a need for increased water storage right where the facility was. 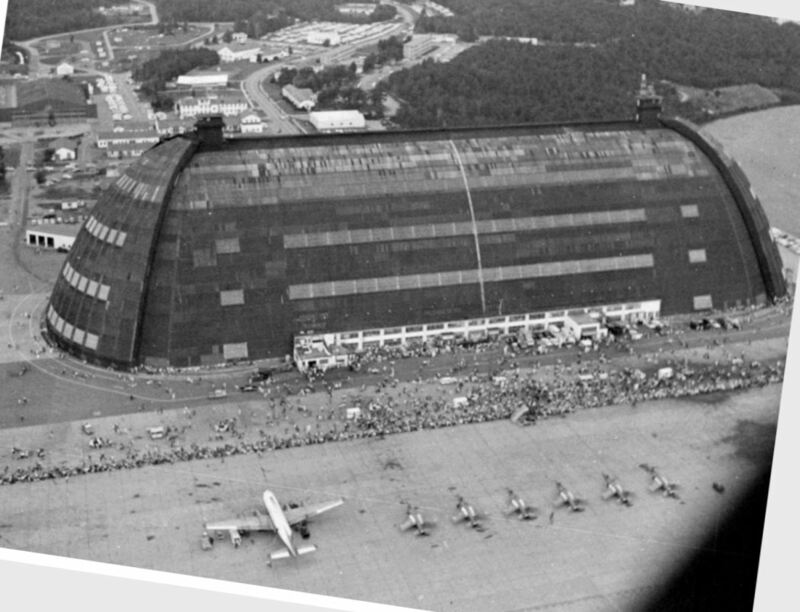 saying that the airport was "an important part of their plan of communication in times of emergency", the commission wrote in 1964.
as a staging point for nuclear radiation monitoring, using geiger counters from the air, according to an article in the Ledger, "Flying Time," by E.S. Locke. Members of the public could also sign up for pilot lessons at the airport and even receive radiological monitoring training. “But by 12/1/64, the airport was closed by order of the Braintree Water Commission. and get down to the back-breaking task of constructing a new 3,000' runway 100' wide," Ledger reporter Larry Masidlover wrote. “Town reports & other archives leave a gap in the timeline here. 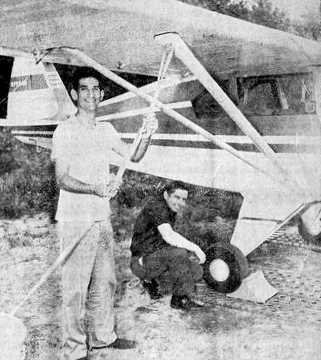 David Keith recalled, “I took my ground school at the old Braintree Airport in 1966, given by Ground Instructor Arnie Stymest. One of my classmates was John Walsh, then a well-known naturalist who starred in 'Walsh’s Animals', broadcast on WGBH Channel 2, Boston. asking them "not to renew the airport license due to the hazards & dangers to the lives & property of residents in the vicinity." “Braintree residents also cited noise as a concern, and mentioned an incident where a motorist was driven off the road because of a low-flying aircraft. The selectmen appeared inclined to agree, but left it to the Airport Commission to draft a report on the issue. adding that the air traffic pattern was usually "over our chimney." 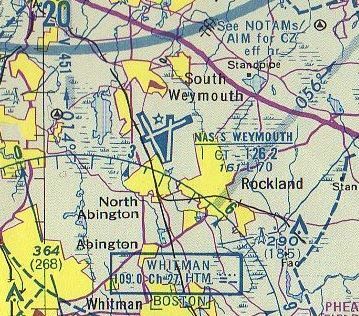 The last aeronautical chart depiction which has been located of Braintree Airport was on the 1964 Boston Sectional Chart. 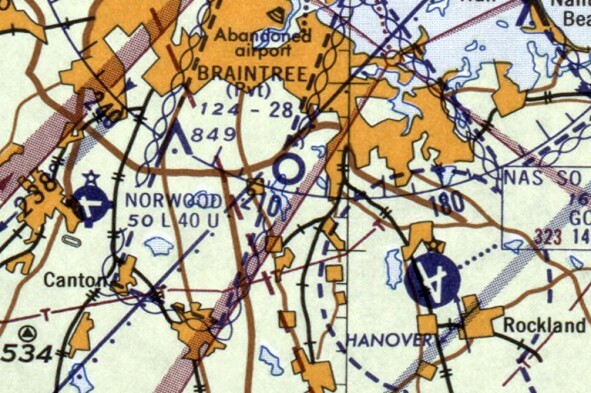 Braintree Airport was no longer depicted on the March 1965 Boston Sectional Chart. The article continued, “Early president of the Braintree Aiport Association & co-founder Victor Heurlin was long gone by this time, Connors said. "People were afraid of the planes," Connors said. "It never bothered me any." when Wilfred Bleakely, who lived on Otis Street in Milton, died after crashing his single-engine plane into the trees lining Pond Road. even as the Airport Commission sought to renew the facility's license, which in July had received a postponement awaiting further study. and called for the removal of all planes & other equipment. which remained in limbo after the closure of the facility. 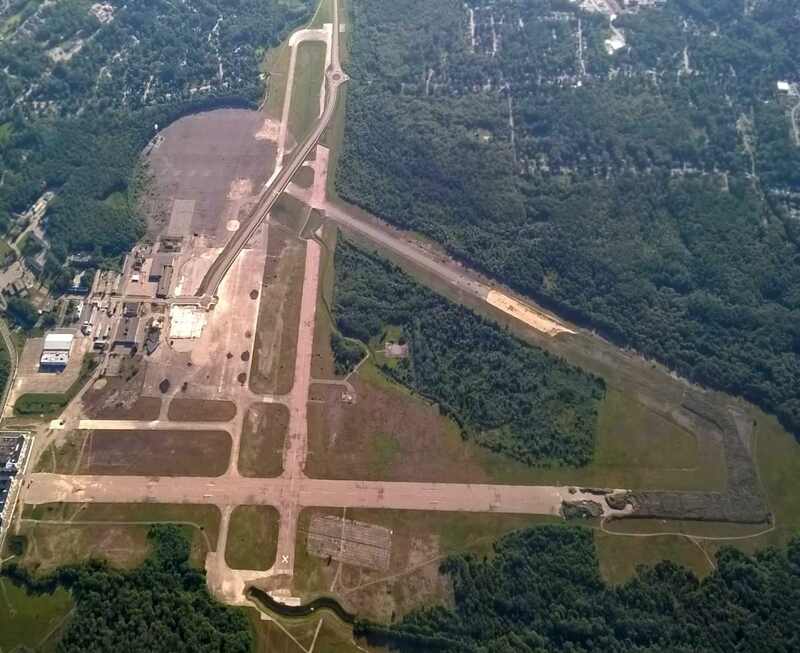 "I think the town could be accused of short-sightedness if we did not delve into the case for an airport,"
the Ledger quoted commission member Silvio Ferrante as saying. "Looking ahead to the 1980s, the town could be missing a bet in not planning carefully now." that led more than 200 Braintree residents to sign a petition to close the town's airport in 1968. 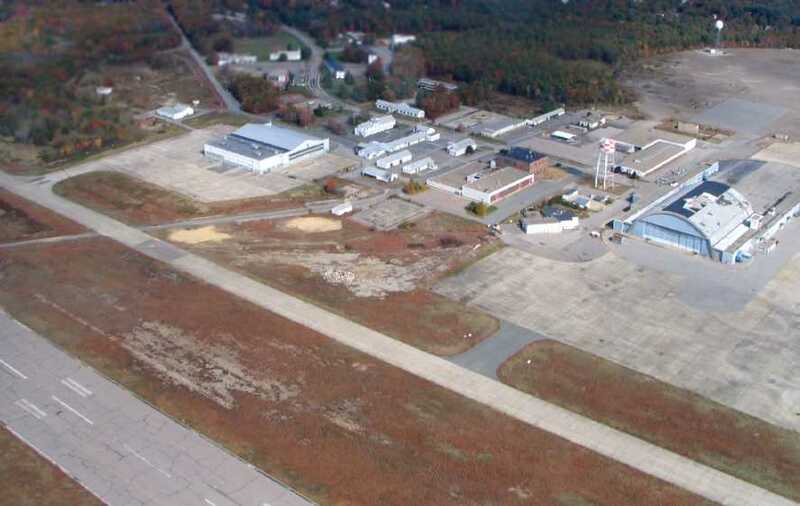 These concerns, along with the need for more water space in town, eventually did lead to the closure of the Braintree Airport. ”I remember soaring up in the clouds & looking down at the earth below because there was space in the floorboards," Connors said in a recent interview. and her half-brother was a skilled pilot, who later went on to a career in flying business executives around the country. 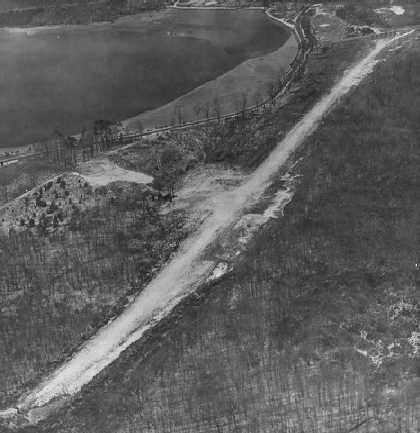 A 1969 aerial view showed a road had been cut over the center of the Braintree runway, which otherwise remained intact. There were no aircraft or any other sign of recent aviation usage. 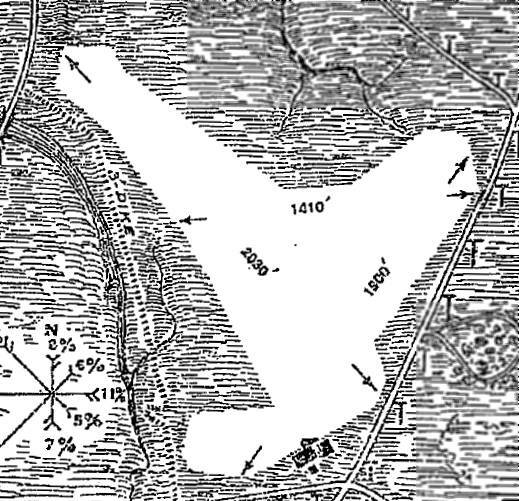 The 1972 USGS topo map no longer depicted anything at the site of Braintree Airport. Steve Clang recalled, “I remember the airfield was still there when I played hockey at Ridge Arena, which was just North of the airport. 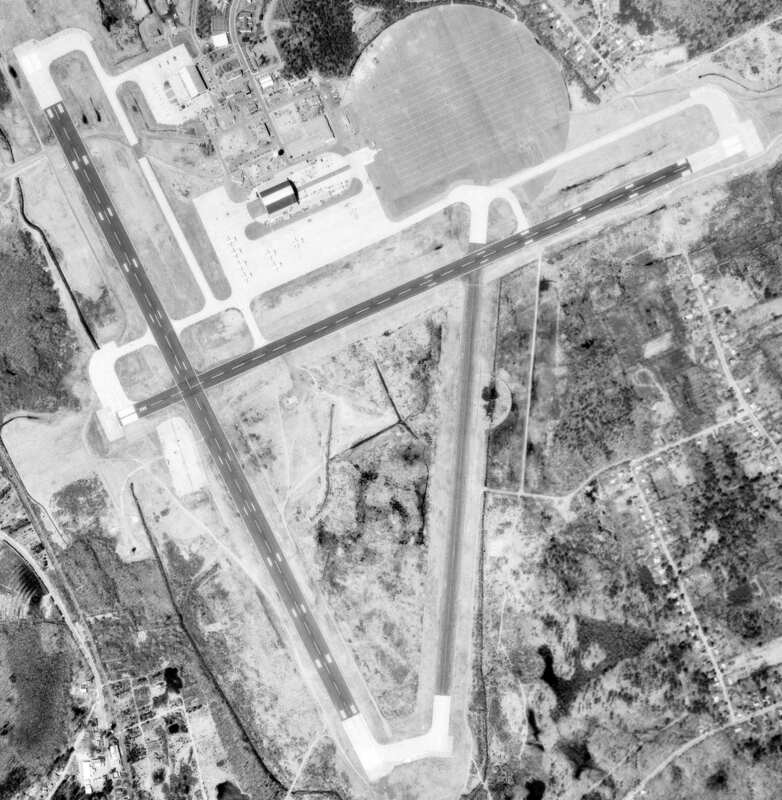 A 1978 aerial photo showed the Braintree runway remained intact, though deteriorated. 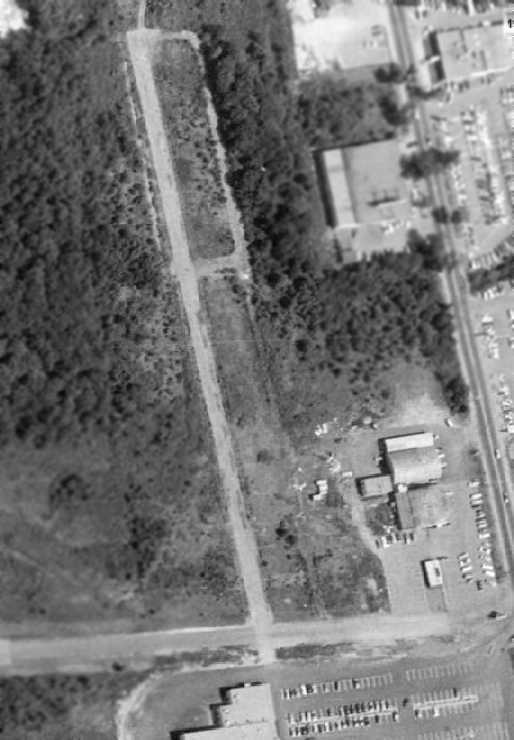 A 2008 aerial view still showed the faintest trace of the orientation of the Braintree runway, though heavilly overgrown. 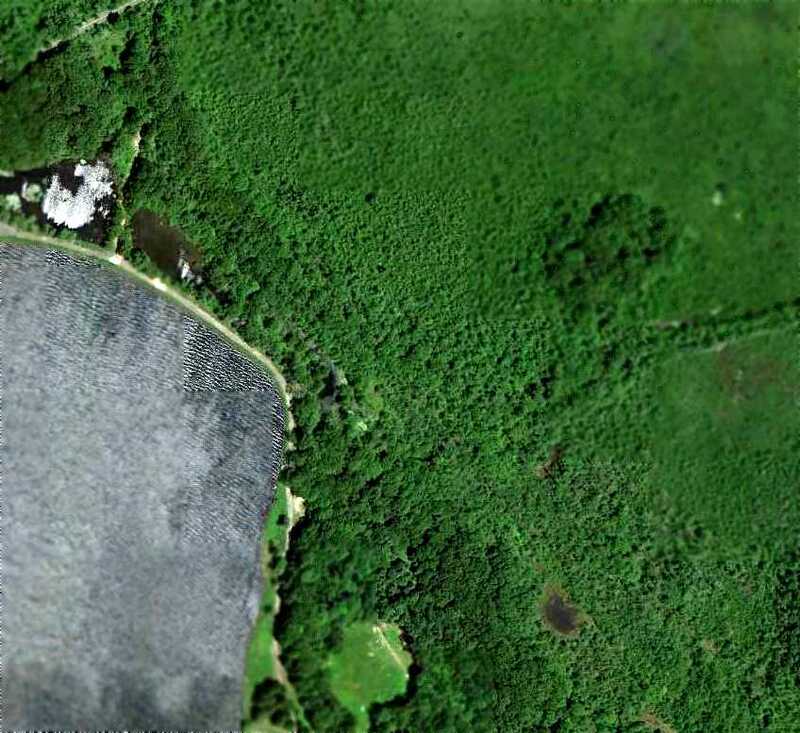 A 6/18/10 aerial view showed no trace remaining of Braintree Airport. The site of Braintree Airport is located east of the intersection of King Hill Road & West Street. 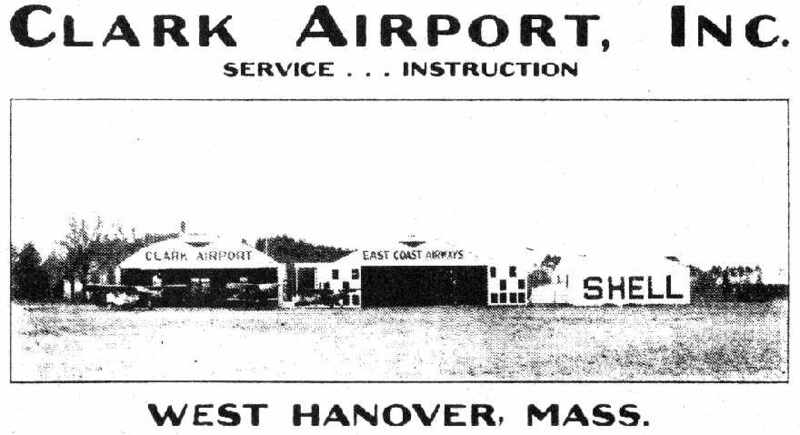 Clark Airport, as depicted in the 1937 “Progress Report of the Committee For Aeronautics of the Commonwealth of MA” (courtesy of Jonathan Westerling). In 1927, William Clark started Clark Airport across Winter Street from his father's fireworks factory. nor listed in the Airport Directory Company's 1933 Airport Directory (according to Chris Kennedy). 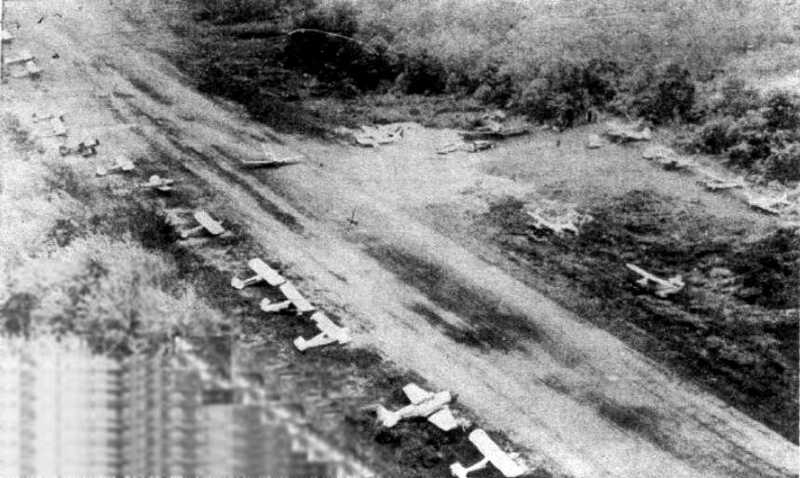 as of 1935 Clark Airport was a commercial airfield located 2 miles West of town center. It was a T-shaped field, having 4 sod runways, the longest measuring 2,100’ northeast/southwest. A hangar was marked with “CLARK FIELD”. Clark Airport was not listed in the Airport Directory Company's 1937 Airport Directory (courtesy of Bob Rambo). was in the 1937 “Progress Report of the Committee For Aeronautics of the Commonwealth of MA” (courtesy of Jonathan Westerling). within which were a total of 4 landing directions, the longest being 2,100' northeast/southwest. 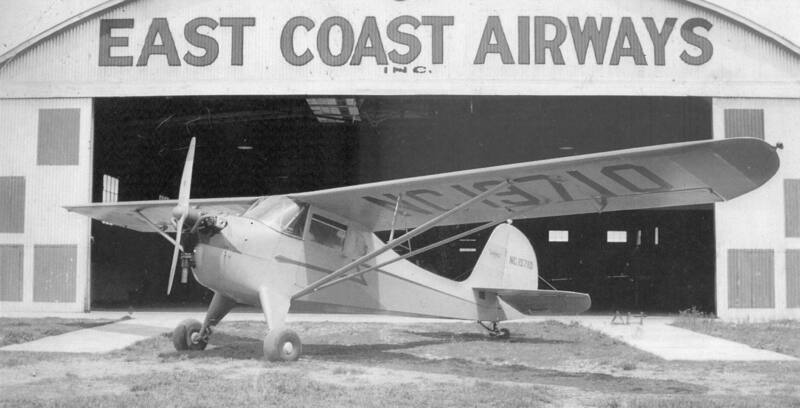 and operated by East Coast Airways (F.J. Bedell). Three hangars & an office building were depicted on the west side of the field. By the late 1930s Clark was reportedly a bustling airport. The Hanover Postmaster used the airport to deliver & pick up mail. 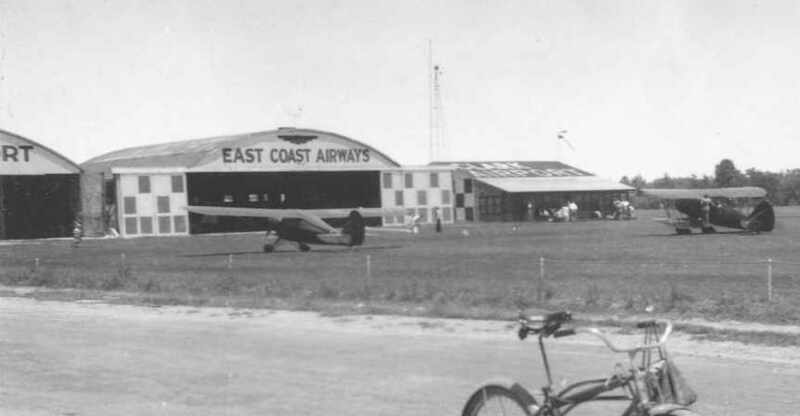 showing several monoplanes in front of 2 hangars, labeled “East Coast Airways”. An undated (1938 or later) photo of an Aeronca K in front of Clark Airport's East Coast Airways hangar (from the MA Aviation Historical Society's 2015 Calendar, courtesy of Bill Deane). A 6/25/40 aerial view looking north at planes at the hangars at Clark Airport by Wendell Levings (courtesy of Andrew Stella). and it was attended by a crowd of 20,000 spectators. 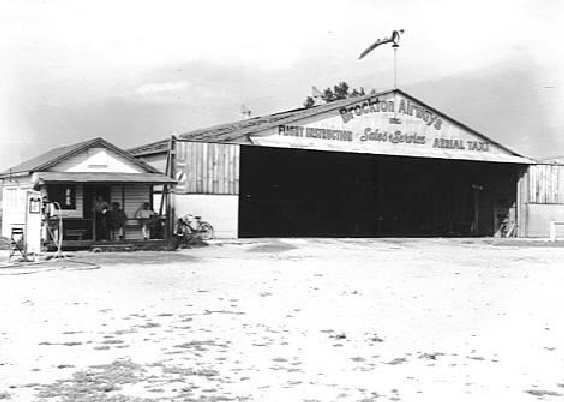 presumably taken during the same air meet sponsored by the Bayside Sportman Pilots' Club & East Coast Airways Inc.
An undated photo of planes & hangars at Clark Airport (courtesy of Andrew Stella). 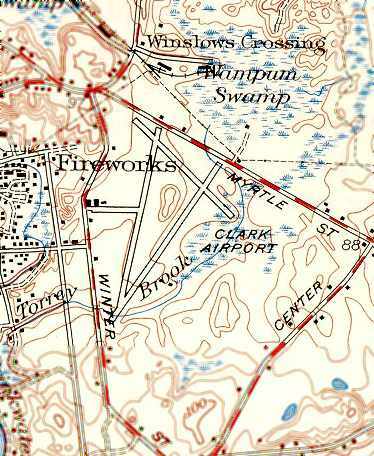 The earliest map depiction which has been located of Clark Airport was on the 1940 USGS topo map. but it did depict 4 small hangars along the northwest side of the field. was on the May 1941 Boston Sectional Chart (courtesy of Chris Kennedy). It depicted Clark as a commercial/municipal airport. bought the airport land from his son William. He needed the space to store supplies for making munitions & the airport was a great space for it. as having purchased a good amount of land on 12/30/41. nor the December 1945 Boston Sectional Chart (according to Chris Kennedy). After the war was over George sold the land back to his son & the airport was once again back in operation. An undated (circa 1940s?) aerial view looking west at Clark Airport (courtesy of Andrew Stella), showing 3 paved runways & a few hangars. with 3 small buildings along the northwest side of the field. depicted Clark Airport as having a 2,400' paved runway. The runways at Clark Airport were said to measure 3,000', 2,500', and 1,650'. The field also had 4 hangars, including a repair shop. 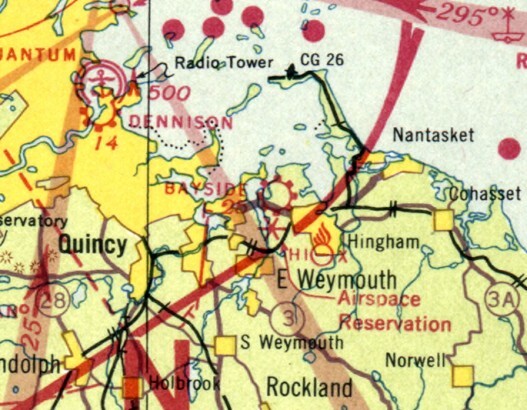 Clark Airport was depicted on the November 1954 Boston Sectional Chart (according to Chris Kennedy). was on the November 1955 Boston Sectional Chart (courtesy of Chris Kennedy). It depicted Clark as having a 2,300' paved runway. In 1958 William Melvin Clark sold the land to the Indian Head Land Trust, who began to develop it as a residential area. (from the 1997 Hanover Historical Society Calendar, courtesy of Andrew Stella). By this time the airport property was in the process of being redeveloped. No traces of the field remained recognizable in a 1960 aerial photo – the site was covered in houses. 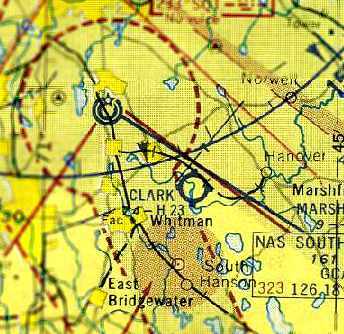 Clark Airport was no longer depicted at all on the March 1963 Boston Sectional Chart (according to Chris Kennedy). for the town of Hanover & the Commonwealth of Massachusetts to deal with. Clark Airport itself was not the polluter. A 2016 aerial view looking north showed not a trace appeared to remain of Clark Airport, with houses covering the property. David Gray reported in 2017, “The old site of National Fireworks Factory in Hanover has a Temporary Flight Restriction over it from ground to 2,000' MSL. This is also the Clark Airport that stored & manufactured munitions during WW2. The site of Clark Airport is located southeast of the intersection of Winter Street & Myrtle Street. 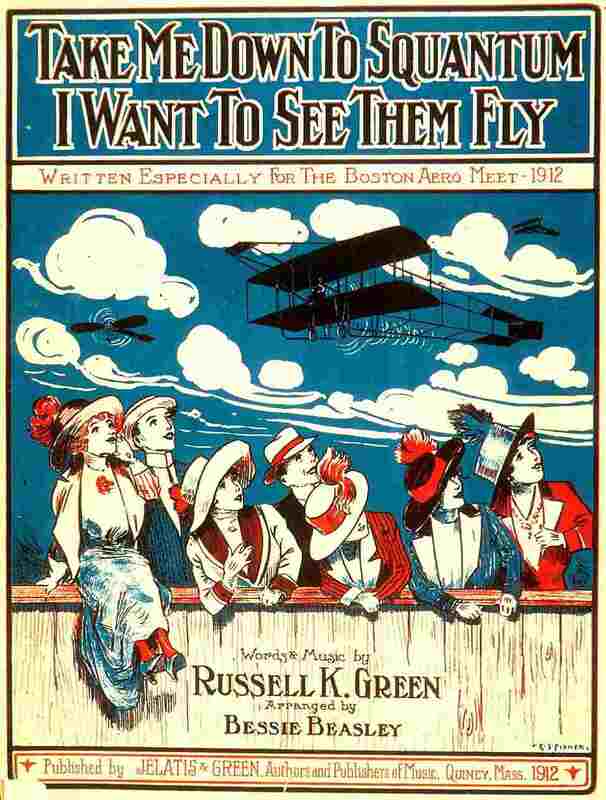 The cover of “Take me down to Squantum, I want to see them fly”, written for Boston's 1912 Aero Meet (courtesy of Rik Sheridan). The origins of the Squantum airifeld date back to 1910.
in 1910 a plot of undeveloped land on the Squantum peninsula was leased by the Harvard Aeronautical Society from the NY & New Haven RR. They used the property to hold the 1910 & 1911 Harvard Boston Aero Meets. 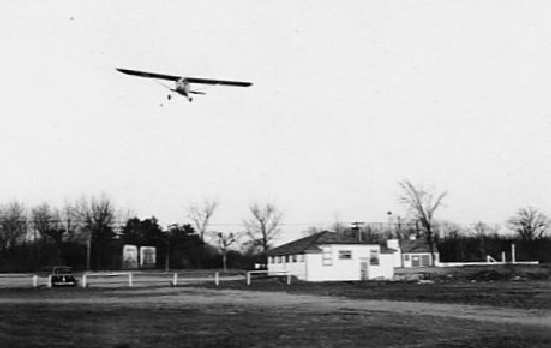 Squantum was the location of the first Intercollegiate Glider Meet in May 1911.
by students from a number of colleges around the country such as Harvard, MIT, Tufts, etc. to allow the participants to launch their craft into the wind regardless of its direction. fell 1,000' to their deaths in the Neponset River from Quimby's Bleriot Monoplane in front of thousands of spectators. and in 1916 the field was leased to the Sturtevant Aeroplane Company for flight testing. showing several floatplanes, including a rare Burgess-Dunn BD & several N-9s. and used the site as a primary flight training facility for student pilots bound for advanced flight training with the Navy at Pensacola, FL. and Squantum became a Naval Air Station providing primary flight training for student naval aviators as well as training for aircraft mechanics. to consolidate all flight training activity in warmer areas of the country where flying could be conducted year-round. A 1917 photo of tents & hangars at Naval Air Station Squantum (from the National Museum of Naval Aviation). and built 35 destroyers between 1918-1920.
as a Naval Reserve Air Station providing refresher training to veterans as well as primary flight instruction to new members of the Naval Reserve. Although initially a Navy Reserve facility, Squantum soon became used by the Marine Corps Reserve as well. A 1926 view of Chance-Vought UO-1 & Burgess-Curtiss N-9H training floatplanes in front of the Naval Reserve Air Station Squantum hangar. At first NRAS Squantum had no airfield & was only capable of operating seaplanes. However, a small 30-acre airfield was built at the base in 1929, permitting operations with landplanes. A photo of a Bristol M1C monoplane (courtesy of Craig Westerman). The original caption read, “Army flier on air jaunt. from Quincy MA to San Diego CA to join the aircraft carrier U.S.S. Lexington. described the Squantum U.S. 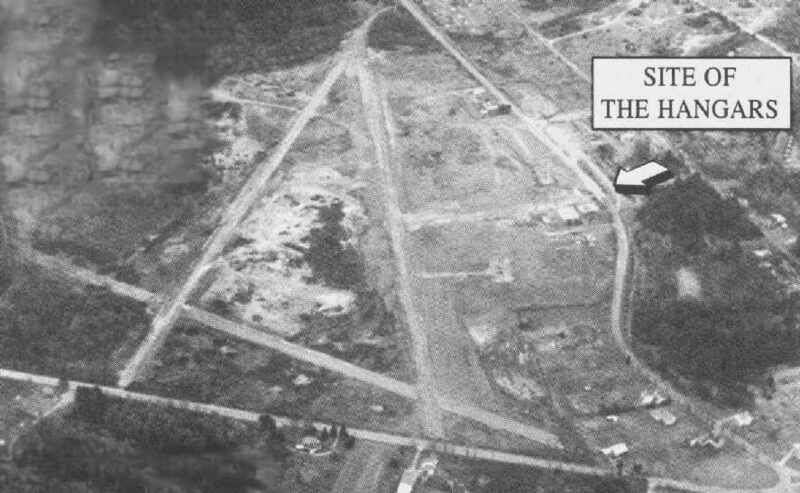 Naval Reserve Aviation Base as consisting of a 30-acre triangular cinder field. along with a 120' x 120' landplane hangar & a 100' x 60' seaplane hangar. The earliest aeronautical chart depiction of the Squantum Seaplane Base which has been located was on the 1933 Boston Sectional Chart. depicted Squantum as having an airfield as well as a seaplane base. 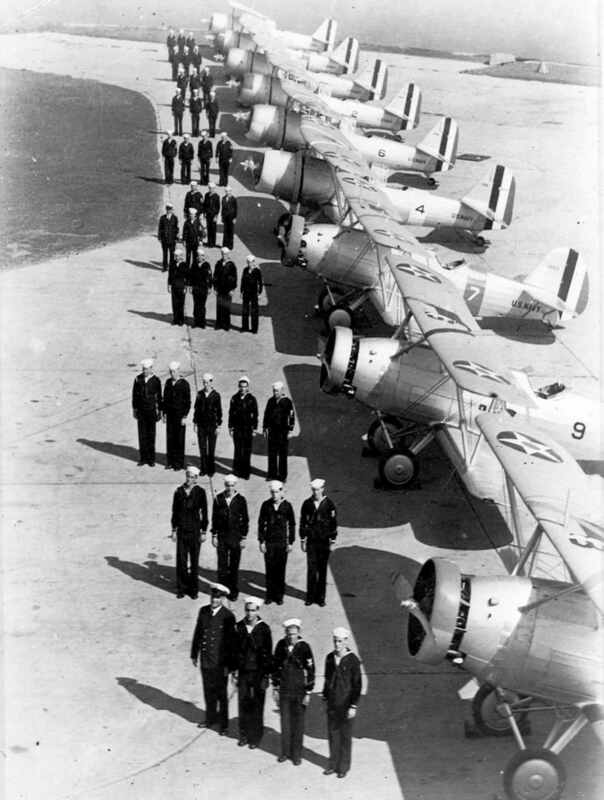 A 1938 U.S. Navy photo of personnel of reserve scouting squadron VS-2R lined up for inspection in front of Berliner-Joyce OJ-2 & Vought SBU aircraft (last 6, background) at NRAB Squantum. 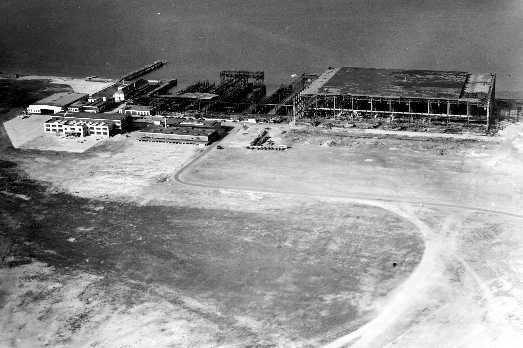 An October 1939 aerial view looking north at the Victory Plant shipyard buildings on the north side of NAS Squantum being removed. 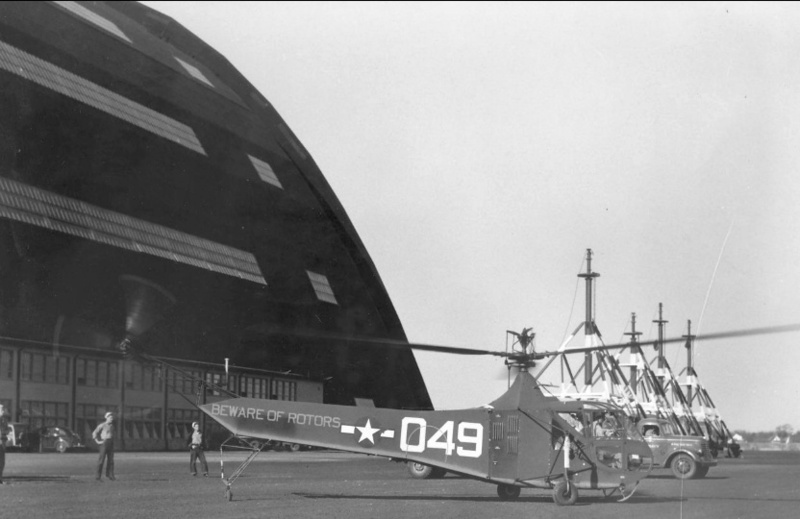 In 1940, the Navy began improving the facility to handle larger planes & seaplanes. including a large seaplane basin on the northern side of the peninsula. These improvements resulted in Squantum being designated a fully-fledged regular Naval Air Station in 1941.
and also served as an operational patrol base helping to protect the waters around Boston Harbor from the German submarine menace. and its land was taken over by the Navy for the expansion of the Squantum facility. which flight tested new equipment being developed at MIT. 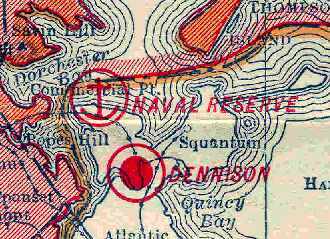 NAS Squantum, as depicted on the 1943 USGS topo map. 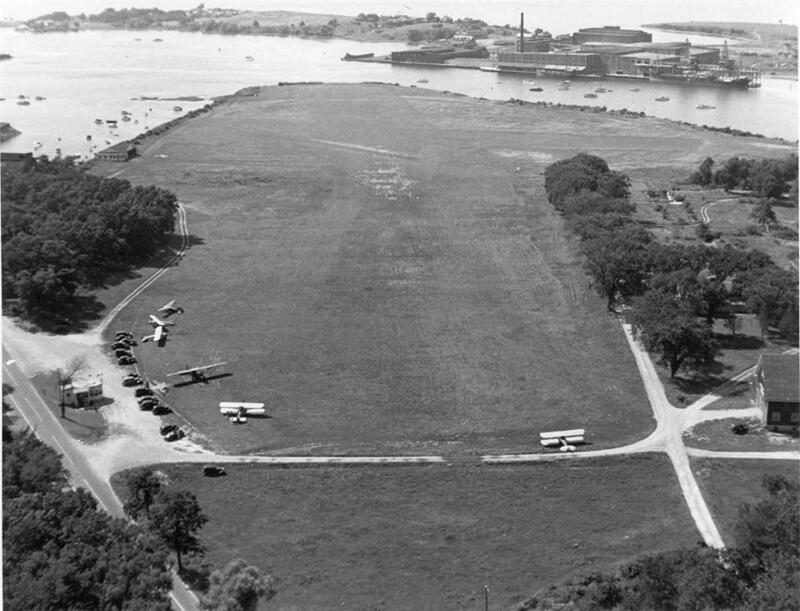 A 1943 aerial view looking southeast at NAS Squantum showed the field to have 3 asphalt runways. and Outlying Fields at Norwood, Plymouth, and Mansfield. 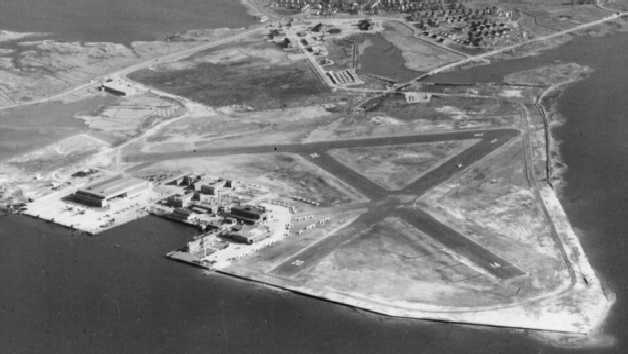 A WW2-era aerial view looking north at NAS Squantum (National Archives photo). "Squantum (Navy)", as depicted on the November 1944 Boston Sectional Chart (courtesy of Chris Kennedy). but did not depict an airfield, strangely. within which were 3 bituminous runways, the longest being the 4,000' northwest/southeast strip. and to have 2 auxiliary fields: 22511 Norwood Municipal Airport to the southwest, and Mansfield Outlying Field, to the south-southwest. A 1945 photo of large numbers of Curtis SB2C Helldivers on Squantum's ramp, with 2 Eastern TBM Avengers on the taxiways. VMF-322 (Replacement for VMF-235), HU-911. At the end of WW2, Squantum continued its flight training program, but at a reduced pace. Squantum's short runways couldn't be lengthened to support operations of new generations of jet aircraft. A March 1948 photo of 2 Consolidated PBY Catalinas & a Douglad R4D Skytrain on a snowy Squantum ramp. 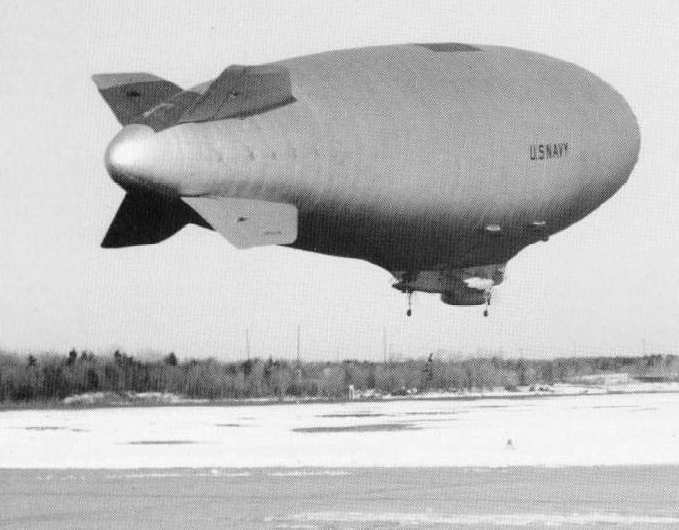 A circa 1950 photo of a US Naval Reserve blimp (model undetermined) attached to a mobile mooring tower at NAS Squantum. 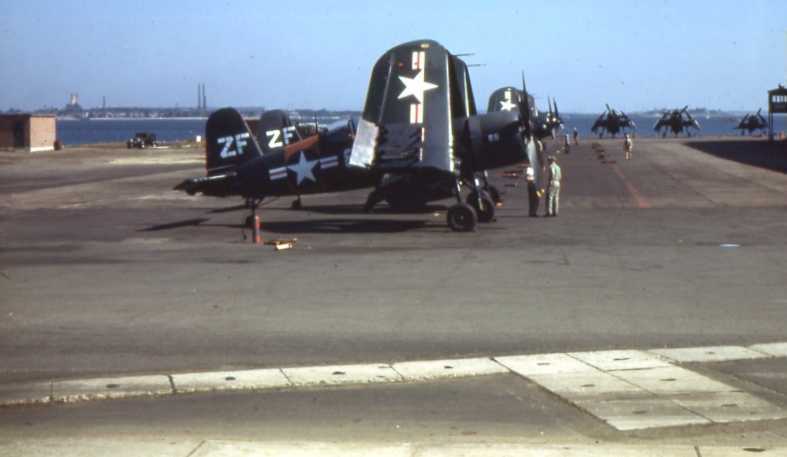 The last photo which has been located showing aircraft at NAS Squantum was a circa 1950 photo of a Chance-Vought F4U Corsairs along the ramp on the north side of the field. Bob Wright recalled, “I enlisted in the Naval Air Reserve at Squantum Naval Air Station in 1952. 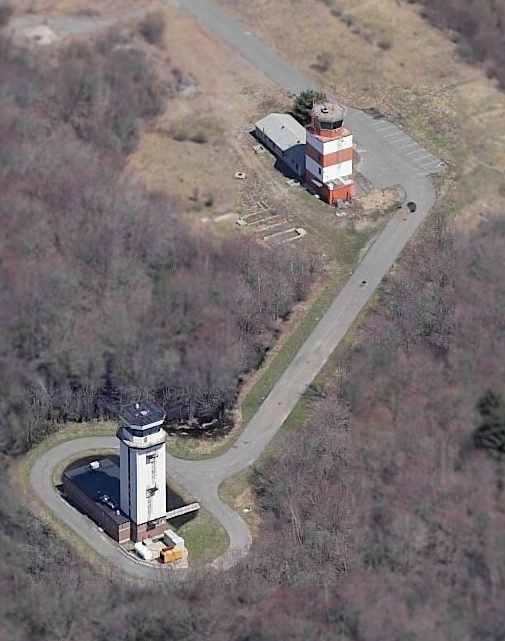 Robert Ervin recalled, “I started my 38 year career as an Air Traffic Controller in Squantum Tower in 1952.
and the next day we reopened NAS South Weymouth about 20 miles south of Squantum. 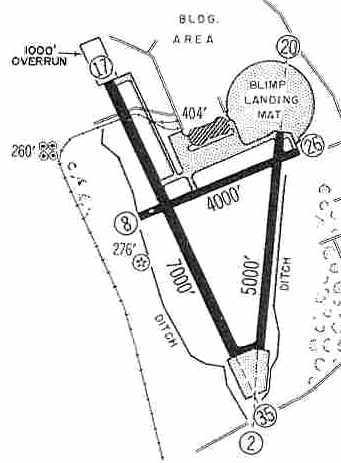 The Boston Logan Instrument Landing System was lined up almost perfectly with that SQT Runway 2. That was another reason that this fine little 'country club' NAS was closed. 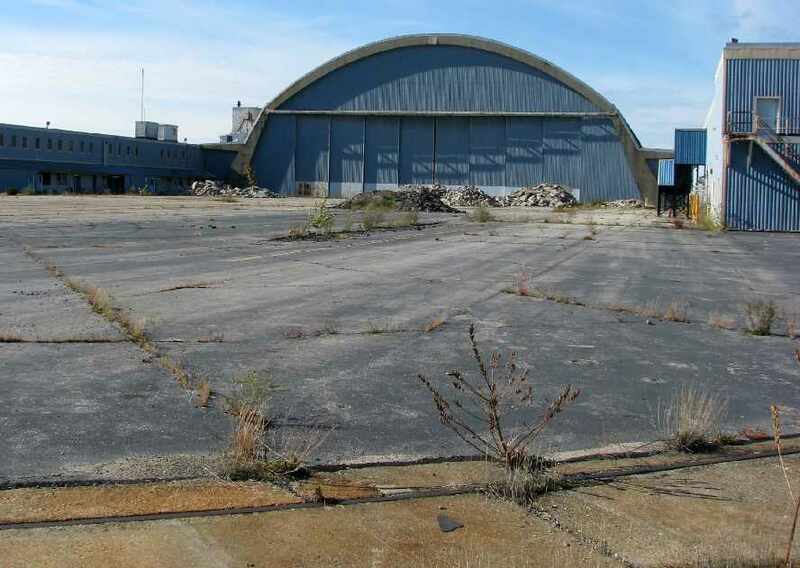 NAS Squantum was closed in December 1953, and the land & buildings were sold. eventually consisted of 3 asphalt runways (the largest was 4,100'), taxiways, ramps & hangars. in which all of the runways remained intact but each were marked with a closed-runway X symbol. along with the buildings along the water on the north side. 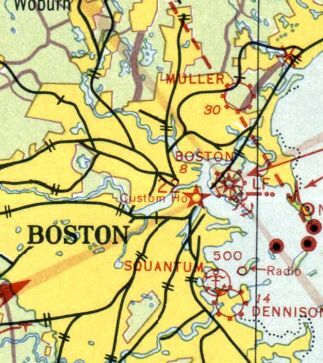 The 1956 USGS topo map didn't depict anything at the site of NAS Squantum. for an electronic research annex, the Squantum Electronics Research Annex. 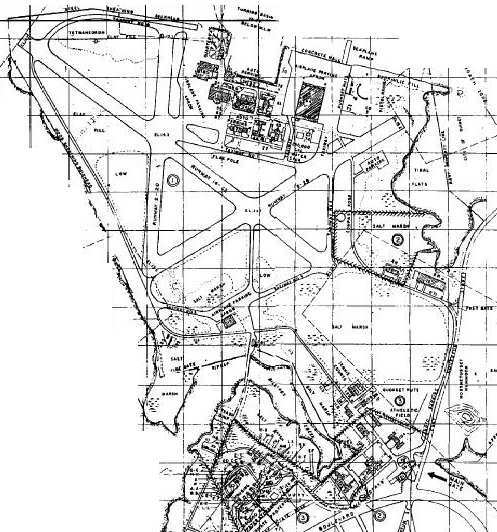 By 1960, the site was labeled "Abandoned Airport" on the Boston Local Aeronautical Chart (courtesy of Mike Keefe). 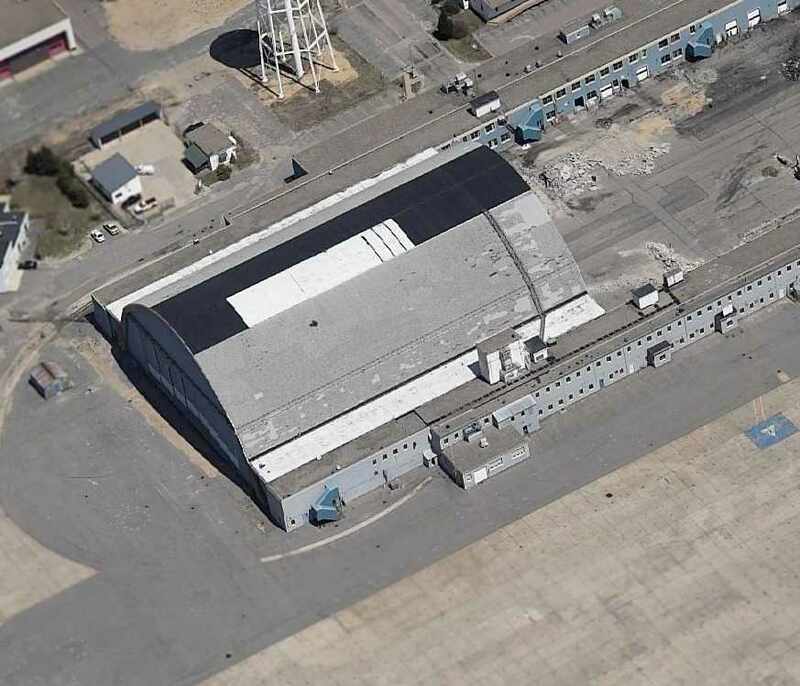 The hangar remained on the southwest side in a 1969 aerial photo. A 1971 aerial photo showed that the hangar on the southwest side had been removed at some point between 1969-71.
surrounded by the high-priced "Marina Bay" luxury condos. A large building (the former Jordan Marsh warehouse) has been built over the southern portion of the property. until acquired by the MDC & Massachusetts Water Resources Authority in the 1980s. which includes an Aviation Walk commemorating the site's aviation history. A circa 2007 aerial view looking east at the remains of Squantum runway pavement. A January 2009 aerial view by Paul Freeman looking west at the remains of the northwest/southeast runway of Squantum NAS. 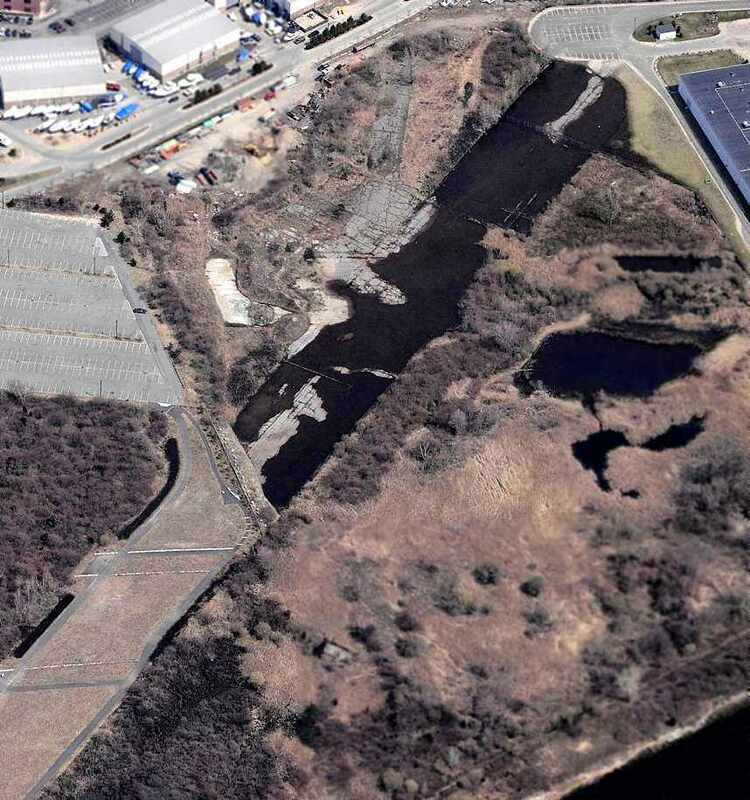 A 2016 aerial view showed the only remains of the northwest end of a Squantum NAS runway was still recognizable. 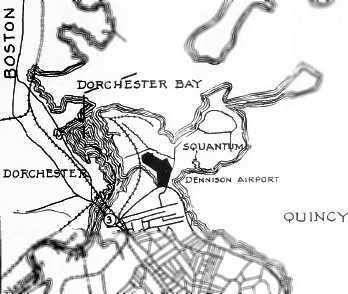 Dennison Airport, as depicted on the 1929 Rand-McNally Air Trails Map of Massachusetts (courtesy of Chris Kennedy). 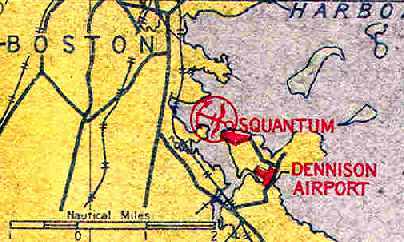 Dennison Airport, a small general aviation field, was constructed in the south side of the Squantum peninsula & opened in 1926. One of the original financial backers of Dennison Airport was Amelia Earhart. Amelia was a passenger on the first flight at Dennison Airport on 9/3/27. Later she learned to at Dennison Airport. The earliest photo which has been located of Dennison Airport was a 1930 photo of a blimp advertising Bird & Son being moored (courtesy of Kevin Rutherford). within which the longest landing area was 2,030' northwest/southeast. The earliest aeronautical chart depiction which has been located of Dennison Airport was on the 1933 Boston Sectional Chart. 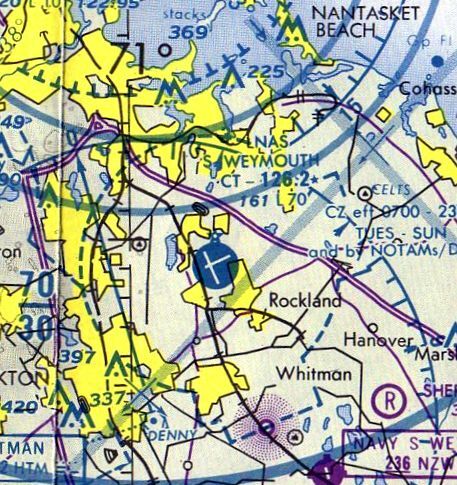 depicted Dennison Airport as a T-shaped field, just to the southeast of NAS Squantum. An undated (circa 1930s?) 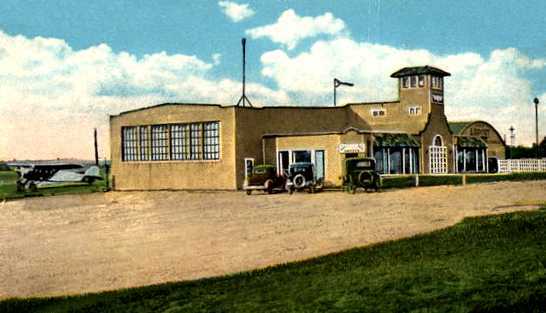 colorized photo from a postcard of the Dennison Airport terminal/hangar (courtesy of Kevin Rutherford). as depicted in the 1937 “Progress Report of the Committee For Aeronautics of the Commonwealth of MA” (courtesy of Jonathan Westerling). within which were 1,900' northeast/southwest & northwest/southeast landing areas. It was described as a commercial airport, owned by the Dennison Airport Corporation & operated by the Dennison Airport Operating Company. Two hangars, an administration building & a repair shop were depicted on the southeast side of the field. A circa 1940 photo (courtesy of Tom Norris) of the Dennison Airport terminal, with “Fly Lessons” visible on the building to the right. Tom noted, the building was “very unusual with its Mission Revival design. as the May 1941 Boston Sectional Chart no longer depicted Dennison. 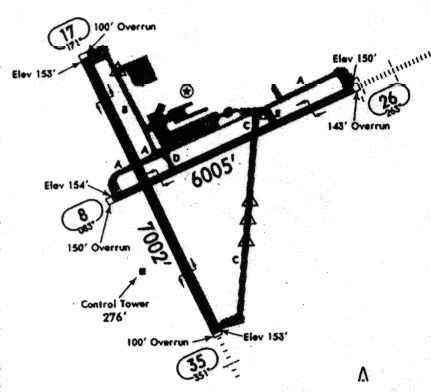 The last labeled depiction which has been located of Dennison Airport was on the 1943 USGS topo map. 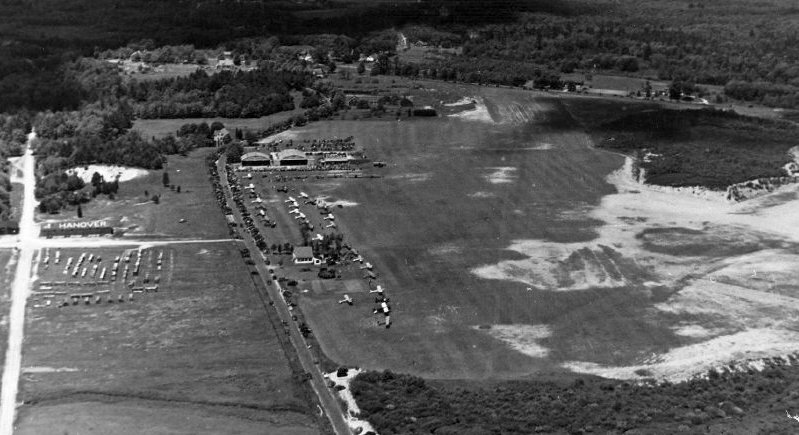 A 1943 aerial view looking southeast at NAS Squantum did not show any trace of Dennison Airport (which would have been at the top-right of the photo). 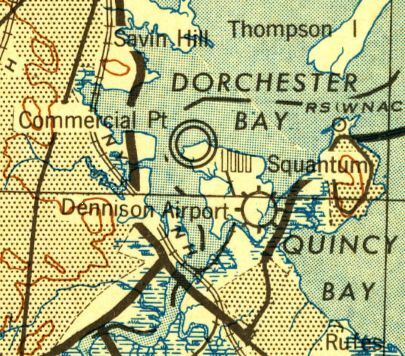 The 1944 USGS topo map no longer depicted Dennison Airport, but rather depicted the Squantum “U S Naval Reservation” as having covered the airport site. Kevin Rutherford reported in 2011, “Dennison Airport mostly exists today at almost sea level. I doubt that they restored the marsh, so I think that it always existed as this (although part of a runway is above sea level). A 2016 aerial view did not show any remaining trace of Dennison Airport. 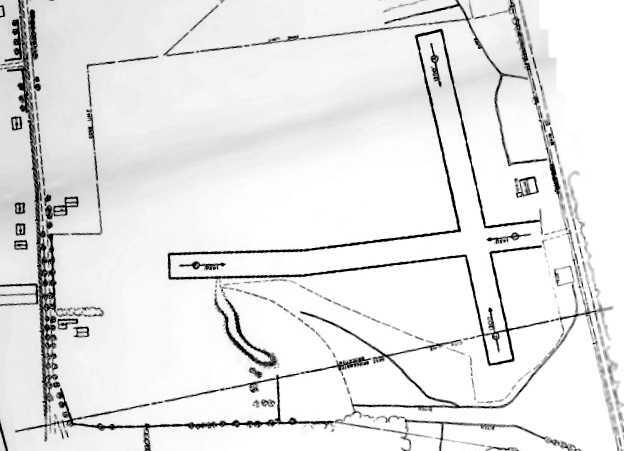 The site of Dennison Airport is located southwest of the intersection of East Squantum Street & Victory Road. 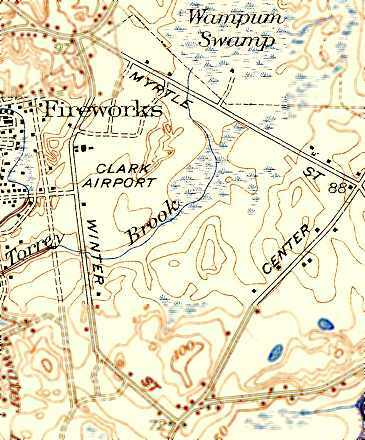 Brockton Airport, as depicted on the 1929 Rand-McNally Air Trails Map of Massachusetts (courtesy of Chris Kennedy). Brockton Airport sprang up in the 1920s on Main Street in Campello & had a single gravel runway. It described the field as a commercial airport, operated by the Brockton Airport Company. The field was said to be quite small, measuring only 2,100' x 800' in size. 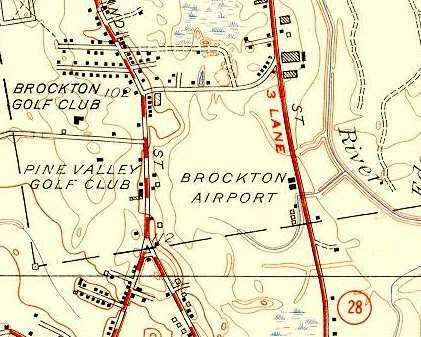 Brockton Airport, as depicted on the March 1933 Boston Sectional Chart. Robert & his father boarded the plane parked on the gravel strip. His father took the middle seat, allowing his son to sit near the window. The youngster immediately leaned over & pressed his nose to the glass, looking down. Andy Ward took his first airplane ride at Brockton Airport in 1936.
he paid 75 cents to ride in the co-pilot's seat. The experience made an indelible impression on the pre-teen even as he made his way to the front of the airplane. "Some wise guy said, 'If that's the pilot, I'm getting off,'" Ward recalled. The Ford Trimotor, to his surprise, lifted easily into the air. "When they took off, I thought they were never going to clear the wires off South Main Street," Ward said. within which were 2 gravel runways: 1,450' east/west & 1,300' north/south. 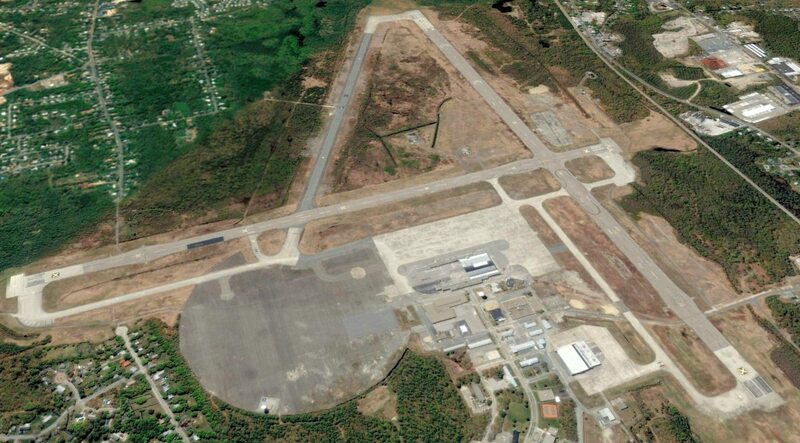 It was described as a commercial airport, owned by James Keith & operated by Lyle & Ames, Brockton Airport. 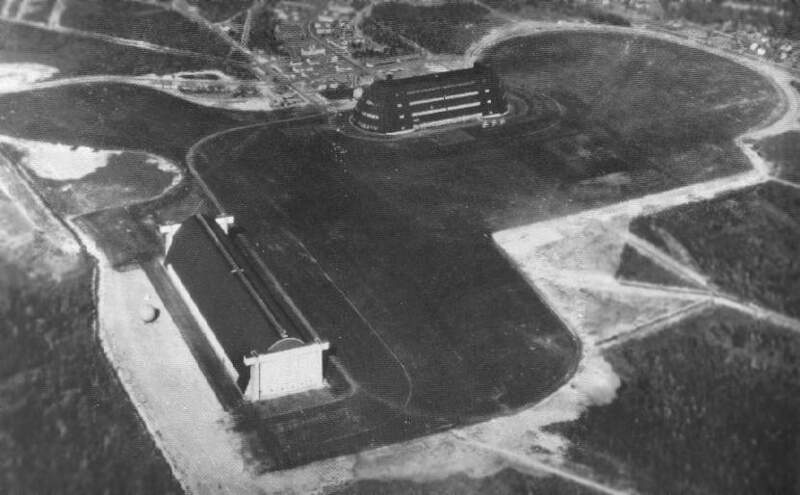 A metal hangar & a wooden office building were depicted on the east side of the field. 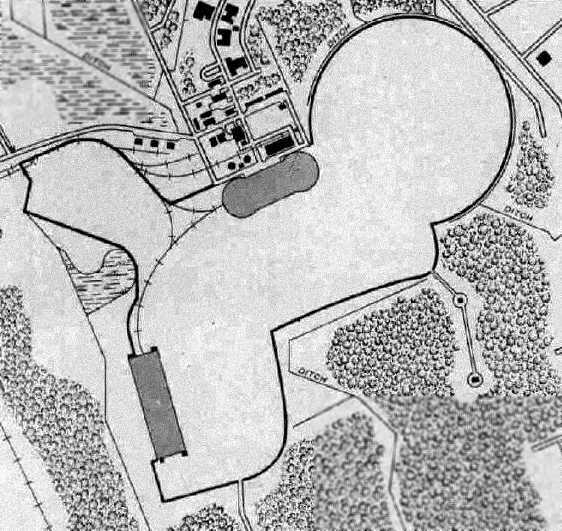 was an undated aerial view from The Airport Directory Company's 1938 Airport Directory (courtesy of Jonathan Westerling). 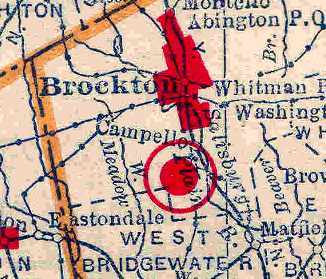 The directory described Brockton as having 2 gravel 1,400' runways, and a few small buildings were visible on the east side of the field. 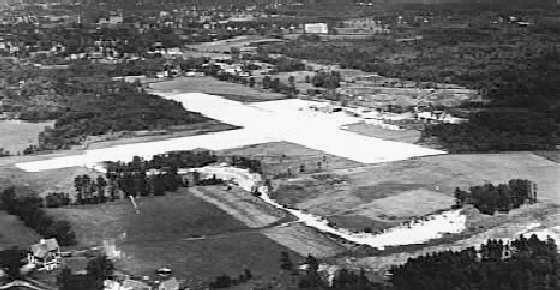 A circa 1940-41 aerial view looking northeast at 4 light aircraft around the Brockton Airport hangar (courtesy of Matt Elia). A circa 1940-41 photo of a crown gathered around several aircraft at the Brockton Airport hangar (courtesy of Matt Elia). but the only details depicted at the site were several small buildings along the periphery of the field. 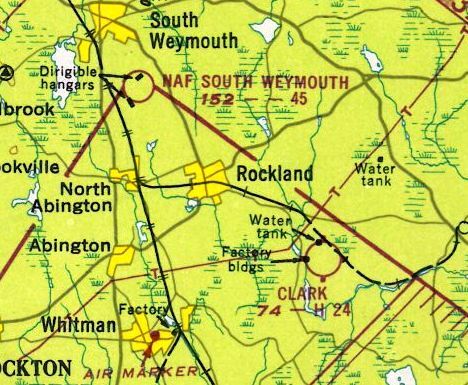 Brockton Airport, as depicted on the 1945 Sectional Aeronautical Chart. decided on a handshake to form a business called Brockton Airways. later purchasing it while Keith held the mortgage. N.A. Trager described Keith as a "Mid-western cowboy transplanted to Brockton." said Keith never learned to fly. "He had no interest in flying," Trager said. "I don't think he was interested in anything faster than a horse." starting the venture in October 1945. During that time, the airport trained numerous war veterans who learned to fly on the G.I. Bill. and Jean Mirling (later to become Jean Hanitsch) worked as the secretary. During their time at Brockton Airways, Jean Hanitsch said about 150 ground boys took flying lessons. solo flying lessons cost $8 an hour. The airport also offered $2 flights around Brockton on Sundays. Flight instruction was given in Piper Cubs. as well as a Stearman biplane. Under Trager's direction, the airport expanded to have 2 runways (north/south & east/west) & 2 hangars. In the winter, planes were equipped with skis as the runways were not plowed. "It was easy to land," Hanitsch said. which was operated by 2 brothers, the late Ken & Bob Fisher. Jean Hanitsch said in the good weather the airport operated from dawn to dusk. "They had to make money when they could," she said. Her husband gave flying lessons to one aspiring pilot after another. 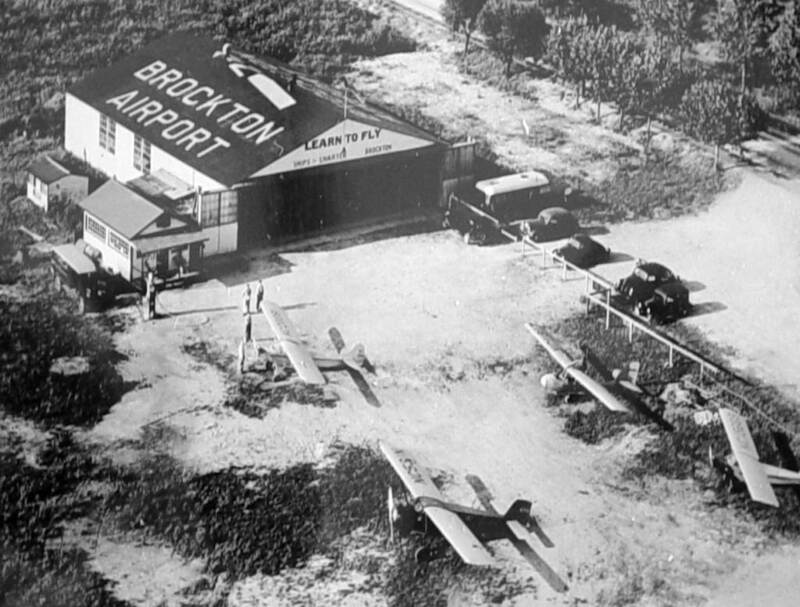 The airport was also the home of the Brockton Flying Club. It was a popular destination, particularly on Sundays when cars lined the fence to watch the planes take off & land. A circa 1946 aerial view of Brockton Airport by Andy Ward. 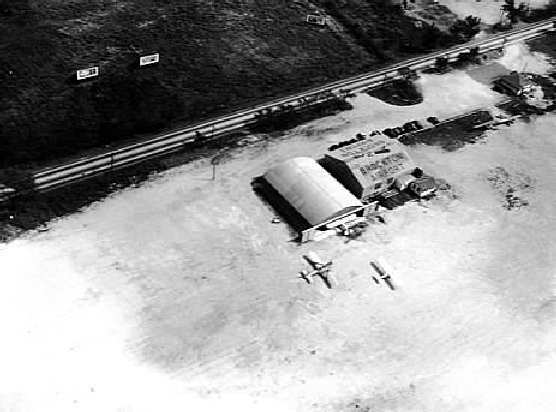 A circa 1946 aerial view of the hangar & office at Brockton Airport by Andy Ward. A circa 1946 photo by Andy Ward of the Brockton Airways hangar & ready room. A circa 1946 photo by Andy Ward of a "Piper Cub passing over South Main Street on a landing approach to the Brockton Airport. 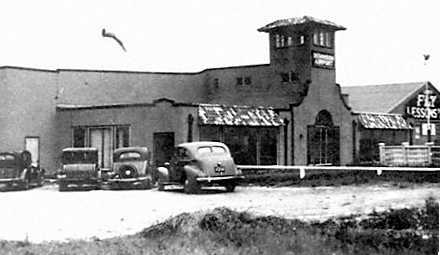 The building shown was the former 'Bob & Ken's Hangar Restaurant'." and an East/West runway of less than 1,500', with telephone wires at both ends. with a thriving GI Bill flight school. just swarming around the pattern. but when something unusual showed up, like a BT-13, DGA or AT-6, that really got my attention! I'd be on my Schwinn Black Phantom in a flash, and would high-tail it to the field in record time." and his beautiful, blonde secretary, on whom I had a serious crush. but finally, the siren song of the air got the better of me. The airport owner, Nat Trager, offered to take me up in his Aeronca Chief. and before I knew it, we were rolling for takeoff. I couldn't believe the din that little Continental made! and watching the ground fall away, as if by magic. At that moment, I was hooked for life! and I was hoping that that Air-Knocker would hold together for just a few more minutes. I guess it was at least a year before I got up the courage to tell my folks that I had been for an airplane ride." David continued, "One time, a Tin Goose flew in & hopped rides. I would have been their first customer, but I wasn't home, and heard about it too late. There were a few crack-ups over the years, but I never heard anyone call for the closure of the field. and they had their clubhouse in a barn, just off the end of Runway 27.
with a 3-cylinder, radial Szekely engine, of 36 hp." David continued, "I used to visit that old barn, years after it was no longer used as the clubhouse. and inhale the perfume of old dope & stale avgas. Those ships were the best simulator a kid could ever have! sitting on their noses with tails in the air, allowing 3 or 4 times as many to be stored." 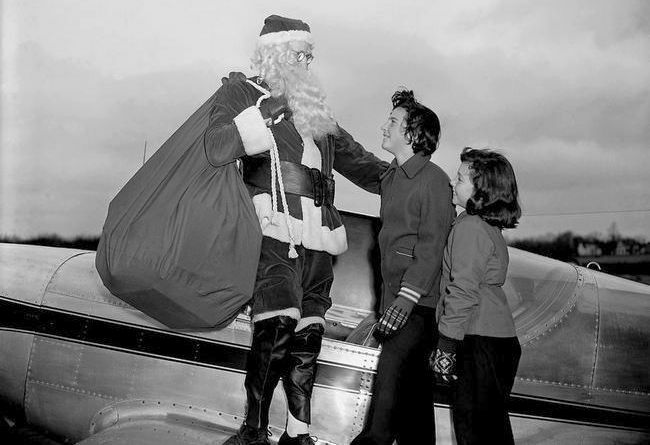 was a December 1950 of Santa Claus being greeted by Judy & Harriet Mechaber on a Globe Swift (courtesy of Brian Hawes). 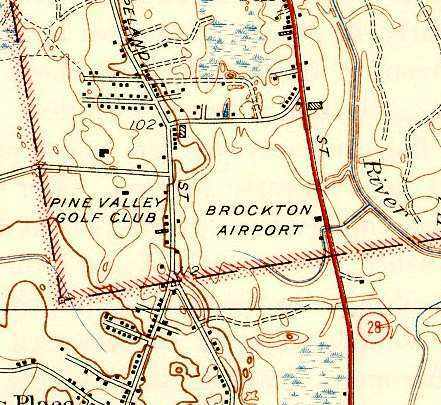 Brockton Airport, as depicted on the 1951 USGS topo map. Messina partnered with 2 other men in running a crop dusting business from a Wareham airport. using a converted J-3 Piper Cub. "It was very successful," Trager said. Trager had hired an experienced southern pilot to fly his crop duster. He urged Messina to do the same. However, his one-time partner opted to fly himself. He died in a crop-dusting accident, and the Wareham airport was phased out. "He was a great fellow. One of the finest fellows I've ever met," Trager said. As the city evolved, Brockton Airways struggled to stay alive. "I believe it would have been better if we had city support," Trager said. but the Aerodromes table listed the field as "Closed". It was said to have an 1,800' hard surface runway. 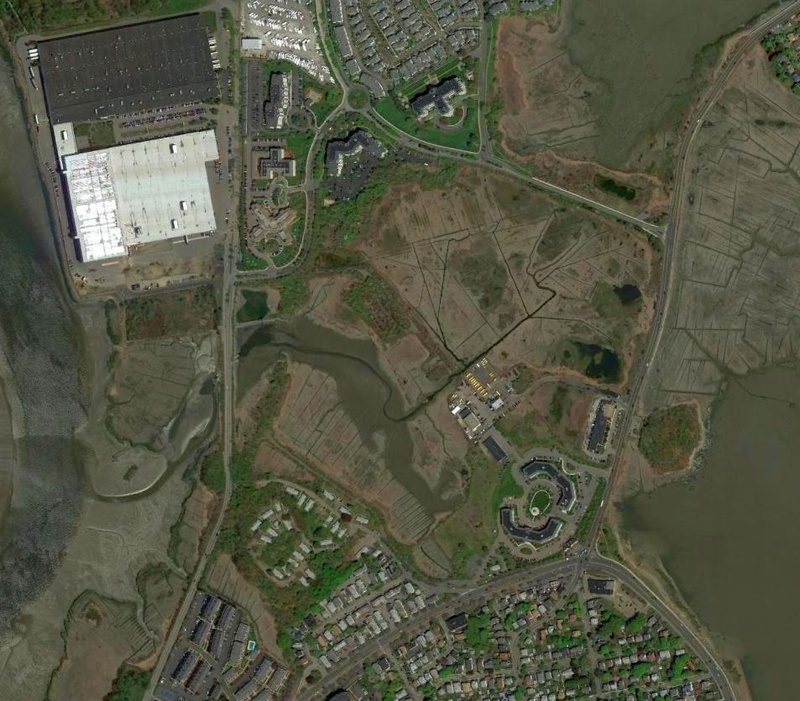 which had been built on the southwestern corner of the former airport site. 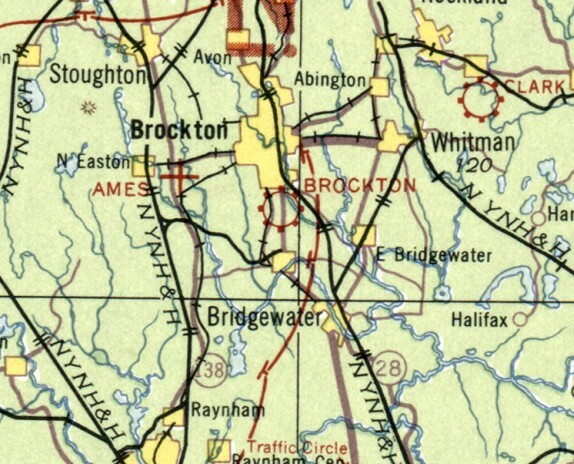 Brockton Airport was no longer depicted at all. as well as a hangar on the east side of the site. leading to a drive-in movie theater on the southwest side. A shopping center had been built over the southeast part of the airport site. the South Shopping Center had covered the remaining portions of the airport. Although Brockton Airways is but a memory, Jean & Robert Hanitsch, Ward and Trager remain friends. None has lost their affection for the wonder of flight. Robert Hanitsch's blue eyes shine as he recalls swooping in & around big white puffy clouds. "It gets in your blood," he said. "Flying to me was something that was very satisfying, I could even use the word 'thrilling,'" Trager said. "I would like to do it all over again." Years later, Andy Ward still thinks about the old airport. "I kind of miss the fact that we had an airport & we gave it up," Ward said. don't know that there's an airport under their feet, with ghosts of rag-wing planes, hovering above." of the intersection of Main Street & Hayward Avenue. Thanks to Richard Griffith for pointing out this airfield. (courtesy of Bill Sargent, Board of Directors, Naval Aviation Research, Weymouth Historical Society). 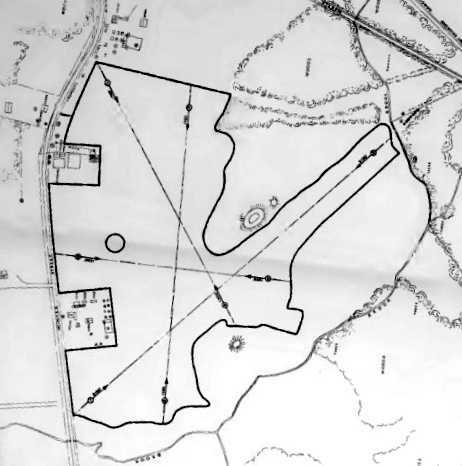 The property which would eventually become South Weymouth NAS was surveyed in 1938 for a proposed municipal airport. nor on the November 1942 Boston Sectional Chart. 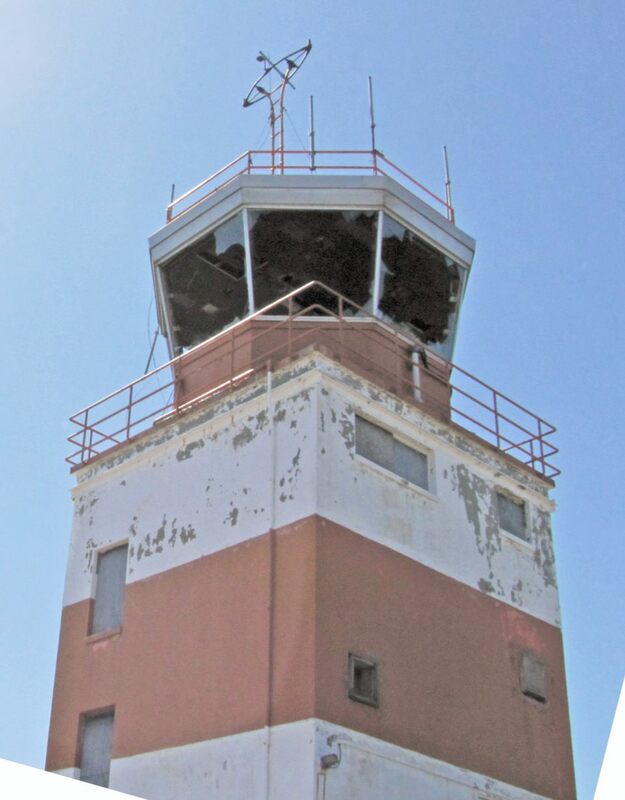 Rick Jones observed, “You can see one of the 2 original control towers built atop the hangar. but the immense size of the hangar blocked the ground view so it was decided to include an additional tower, positioned at each end. Access to them was on a suspended arched catwalk inside the hangar. On very humid days the condensation that built up inside due to the cooler temperature sometimes caused it to 'rain' inside. 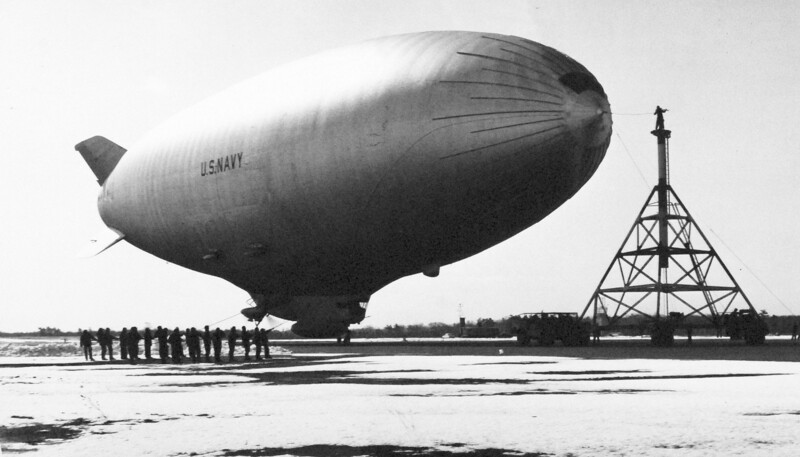 South Weymouth was eventually commissioned in 1942 as one of the Navy's ASW blimp bases. 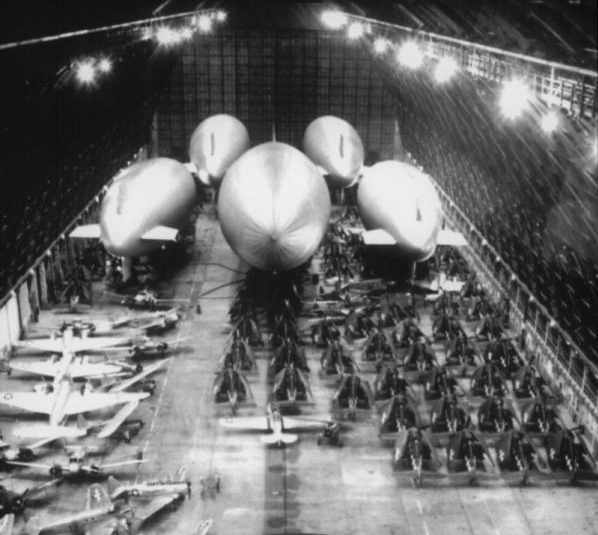 A WW2-era view looking northeast at the 2 blimp hangars at South Weymouth (National Archives photo). one of which was the world's second largest blimp hangar, measuring 956' across. The base had a 2,000' diameter blimp mat, 6 mooring circles, and a 4,500' grass runway. South Weymouth operated a complement of 12 blimps. 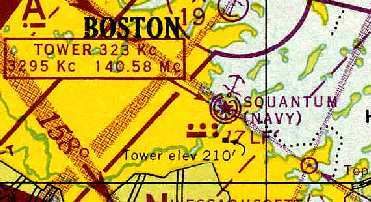 The earliest aeronautical chart depiction which has been located of NAS South Weymouth was on the November 1943 Boston Sectional Chart. within which was an oiled gravel landing area, with the longest dimension being 4,450' east/west. 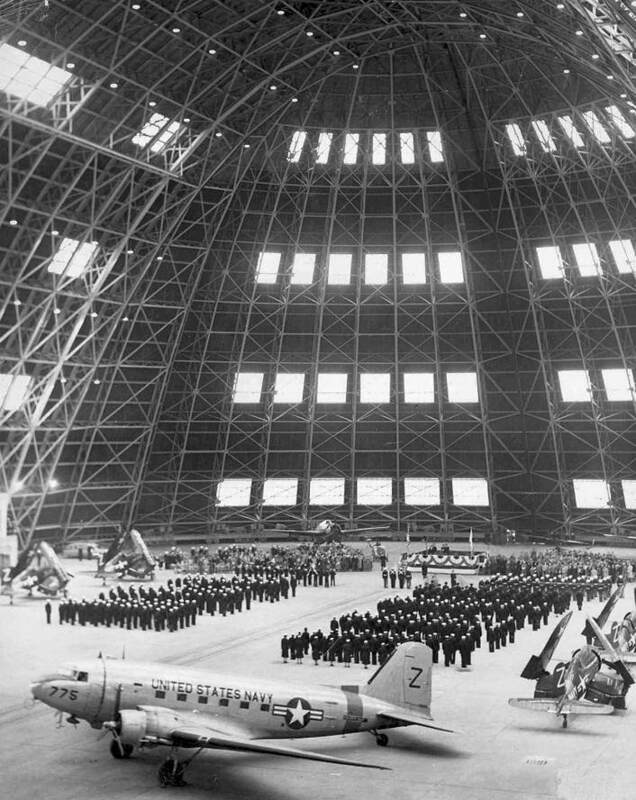 The field was said to have 2 hangars: 1,058' x 296' wood & concrete & 960' x 337' steel. 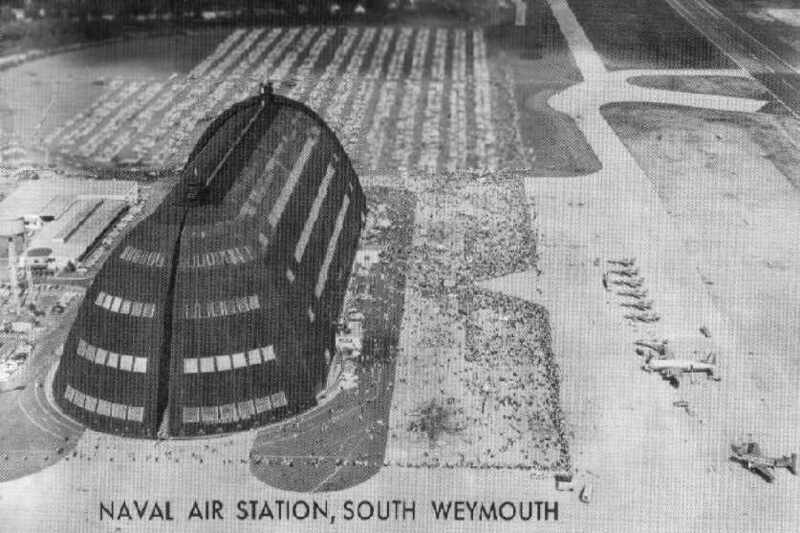 Following WW2, South Weymouth was downgraded to a Naval Air Facility. being designated as a Naval Aircraft Parking Station. Curiously, northing at all was depicted at the location of NAS South Weymouth on the 1947 Army Map Service topo map. 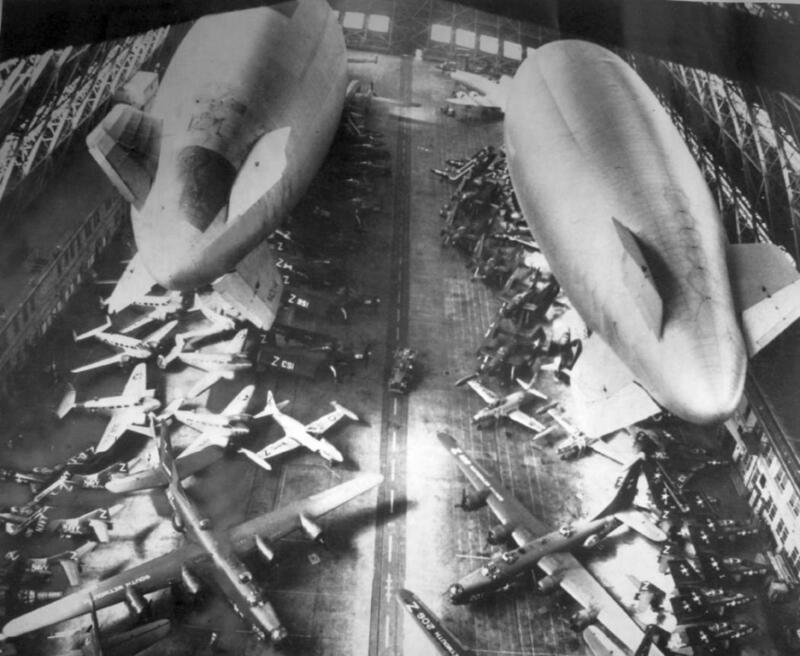 showing 5 blimps & dozens of fixed-wing aircraft stored simultaneously inside the massive hangar. depicted NAF South Weymouth as having 2 dirigible hangars & a 4,500' unpaved runway. and short runways that were unsuitable for routine jet operations. 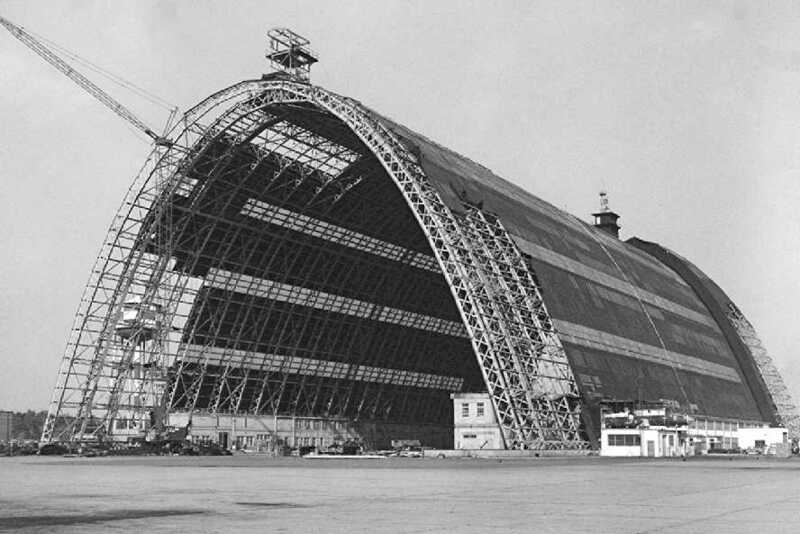 the wooden blimp hangar, Hangar Two, was demolished & 3 paved runways were built. in front of a the massive blimp hangar & a row of 4 blimp mooring towers. and the next day we reopened NAS South Weymouth. A 12/8/53 photo of ceremony (change of command?) inside the South Weymouth blimp hangar (courtesy of Marc Senger). Aircraft visible include a Douglas R4D-6 Skytrain BuNo 50755 c/n 26138 'Z-755', Chance-Vought F4U Corsairs, and a Grumman TBF Avenger. stored inside the massive South Weymouth blimp hangar in preparation for hurricane Carol. A 1957 Navy photo of the ZPG-2 "Snow Bird" departing from South Weymouth on a record-breaking long endurance flight. showing a blimp & 3 P-2 Neptunes on the circular pad, another plane taxiing, and at least 2 planes parked next to Hangar 1. A 4/22/57 USGS aerial view showed a wide variety of jet & propeller aircraft on the NAS South Weymouth ramps & blimp mooring pad. A 3/13/57 photo of a ZPG-2 airship being marshalled by ground handlers just before takeoff from NAS South Weymouth. resulting in 2 paved runways of 7,000' & 6,000' length. leaving only 1 remaining blimp hangar (Hangar #1). with Hangar 1 in the background, and what appear to be 2 P-2 Neptunes & 2 Lockheed WV-2 Warning Stars on the ramp. 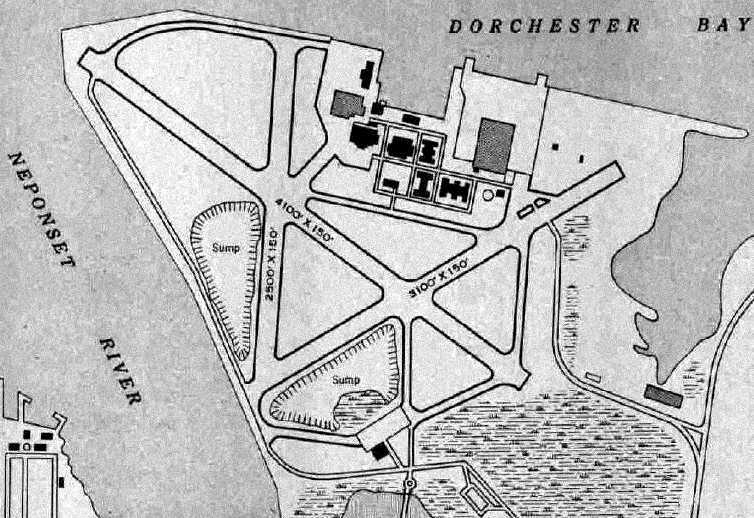 NAS South Weymouth, as depicted on the 1960 Boston Local Aeronautical Chart (courtesy of Mike Keefe). with the longest being the 7,000' Runway 17/35 (which had an additional 1,000' overrun). The blimp landing mat was still depicted, as was the blimp hangar. 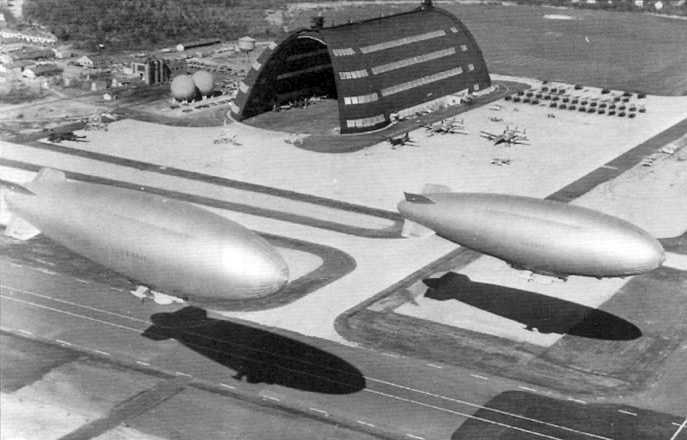 Blimp operations were discontinued at South Weymouth by the early 1960s. “A Salute to the Navy's Golden Wings: Naval Air Station South Weymouth” (courtesy of Robert Randall). from the 1963 air show program (courtesy of Robert Randall). The F11F-1 Tigers of the Blue Angels are lined up on the right side. with the F11F-1 Tigers of the Blue Angels lined up in front of the crowd. of Heavy Attack Squadron 3 on display inside the massive NAS South Weymouth blimp hangar. A circa 1963 photo of a Lockheed T2V Seastar assigned to Naval Air Reserve Training Unit Dallas TX seen at NAS South Weymouth (from the National Museum of Naval Aviation). An undated view of 2 early flight simulators at NAS South Weymouth, from the 1963 air show program (courtesy of Robert Randall). were converted to Anti-Submarine Warfare Operational Flight Trainers, for a total installation cost of only $5,000. and they were installed on the flat roof adjoining the ASW training spaces in Hangar #1.
when I went to NAS South Weymouth for my flight physical before OCS. 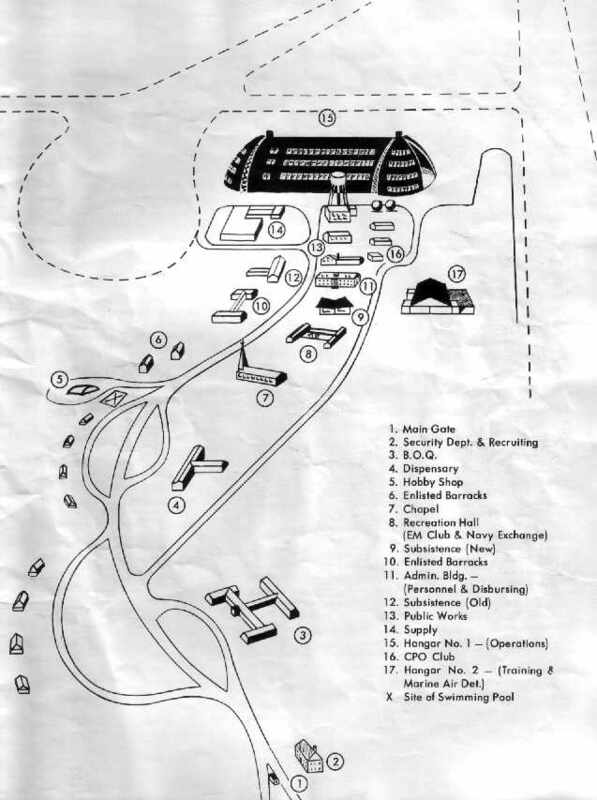 NAS South Weymouth, as depicted on the 1968 Boston Sectional Chart (courtesy of Chris Kennedy). 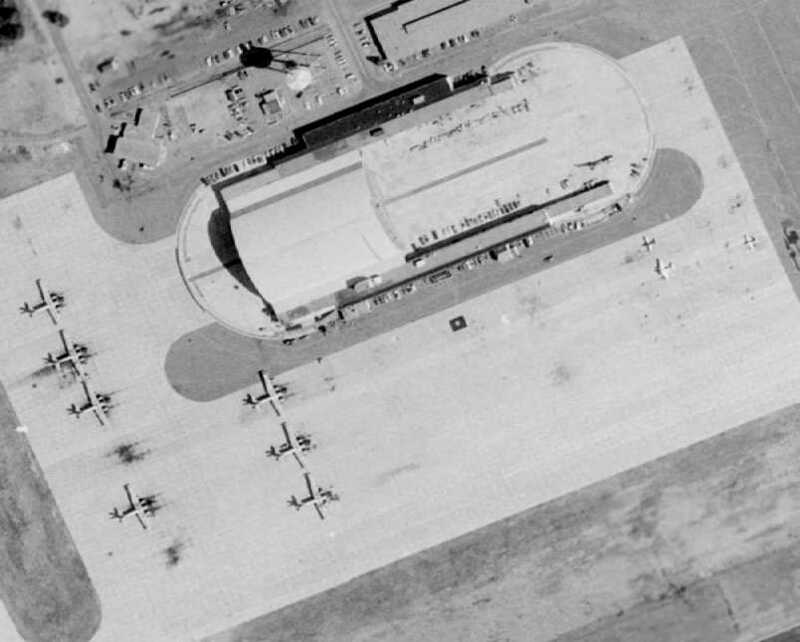 A 1969 aerial view of South Weymouth's ramp showed 3 Lockheed P-2 Neptunes, as well as 5 smaller aircraft & helicopters. 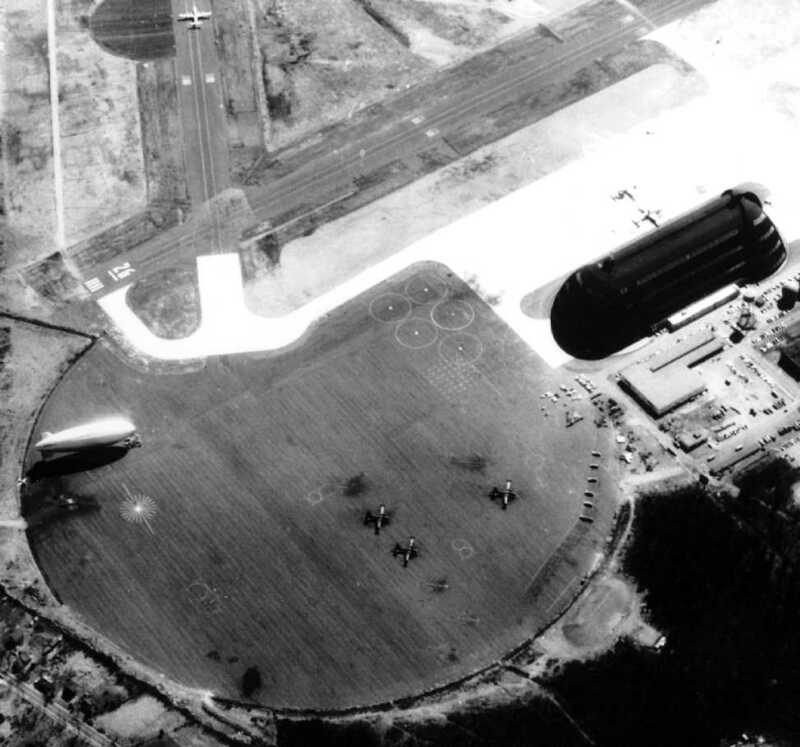 A 1971 aerial view of South Weymouth's ramp showed 7 Lockheed P-2 Neptunes, as well as 3 light aircraft. Note the concrete arch hangar which was built over the western third of the foundation of a former blimp hangar. 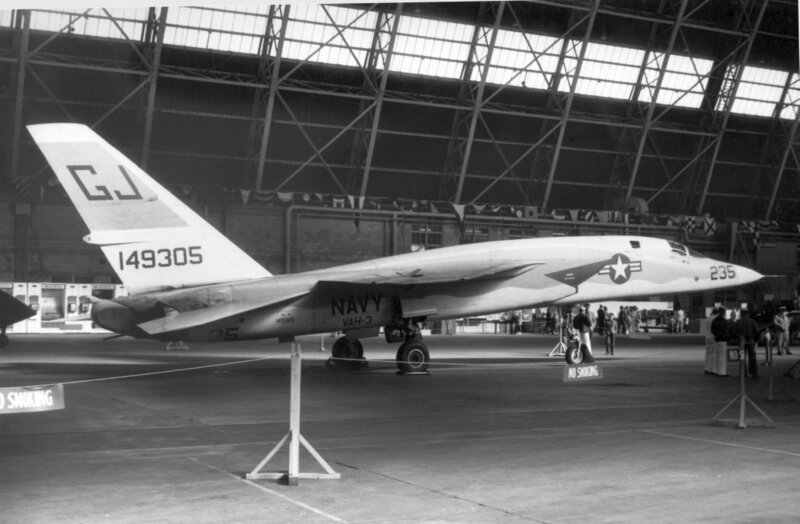 A 8/18/73 photo by Tom Hildtreth of a beautiful North American RA-5C Vigilante at South Weymouth. 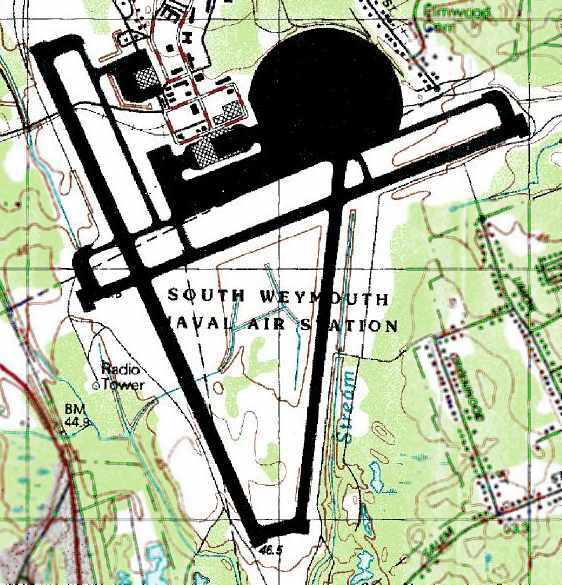 depicted NAS South Weymouth as having 3 paved runways, with the longest being 7,000'. 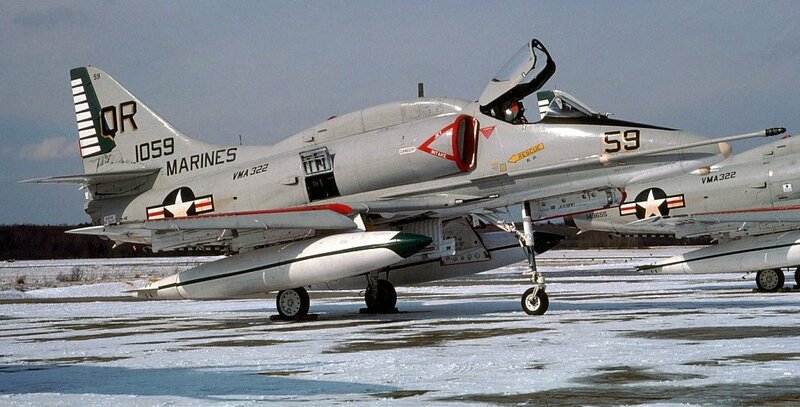 An 8/2/76 photo by Tom Hildtreth of a USMC Douglas A-4E Skyhawk at South Weymouth. "at the Navy Weymouth Aero Club from 1977 to the club's closure in 1984." A 4/23/78 USGS aerial view showed P-3 Orions on NAS South Weymouth's main ramp & smaller jet aircraft on its northwest ramp. A series of circa-1985 photos by Peter Kodis of aircraft at South Weymouth: an SH-3, UH-1, A-4s, and F-14. 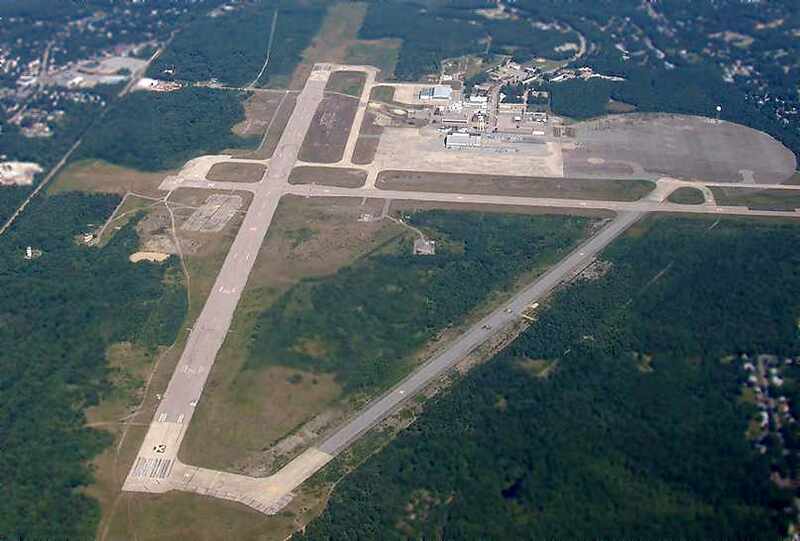 depicted NAS South Weymouth as having 2 paved runways, with the longest being 7,000'. as having 3 paved runways, taxiways, ramps, 2 hangars, and the giant paved blimp mooring circle. John Gamel recalled, “Oddly enough, a 22-year career in the FBI brought me back to NAS South Weymouth in late 1990.
was on the December 1992 Boston Terminal Aeronautical Chart (courtesy of Gwen Shafer). 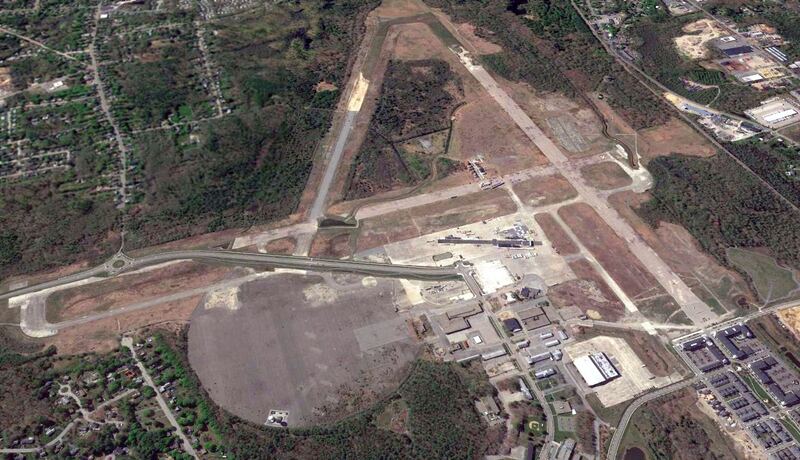 It depicted NAS South Weymouth as having 2 paved runways, with the longest being 7,000'. as well as numerous taxiways & ramps. but it would be 2 more years before the recommendation was implemented. A 4/2/95 USGS aerial view looking south depicted only 4 aircraft on South Weymouth's expansive ramps: 2 C-130s & 2 P-3s. A 1996 picture by Christopher Gatto of an F/A-18B & F/A-18A of the Navy's Blue Angels taxiing at South Weymouth's last airshow. The Blue Angel's C-130 “Fat Albert” is visible in the left background. was a 1996 picture by Christopher Gatto of an F-14 Tomcat taxiing at South Weymouth's last airshow. 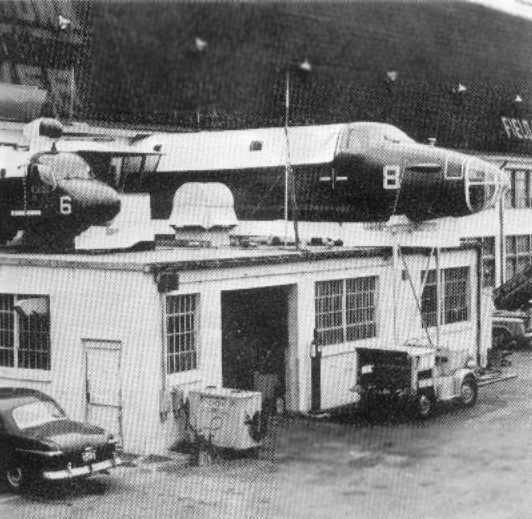 A South Weymouth hangar is visible in the left background. 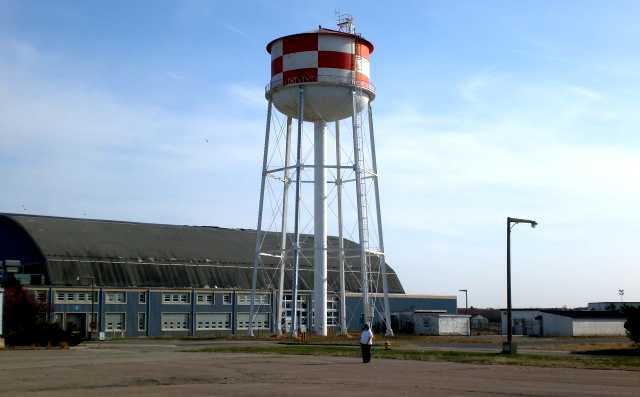 "A few months before the base received its closure notice, they had decided to install a new tower. The contract went out to bid & it was awarded right before the closure announcement. Since the contract was already signed, they didn't want the contractor to take the money & run - the Navy wanted the work done. The tower was never outfitted; it's completely empty!" 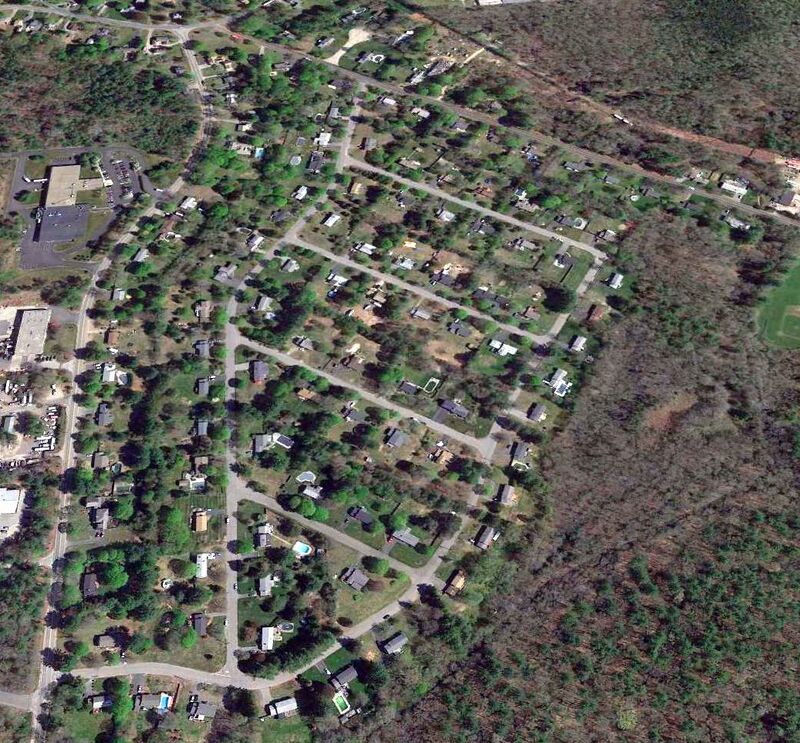 Increasingly surrounded by development of the expanding Boston suburbs, South Weymouth closed on 9/30/97. 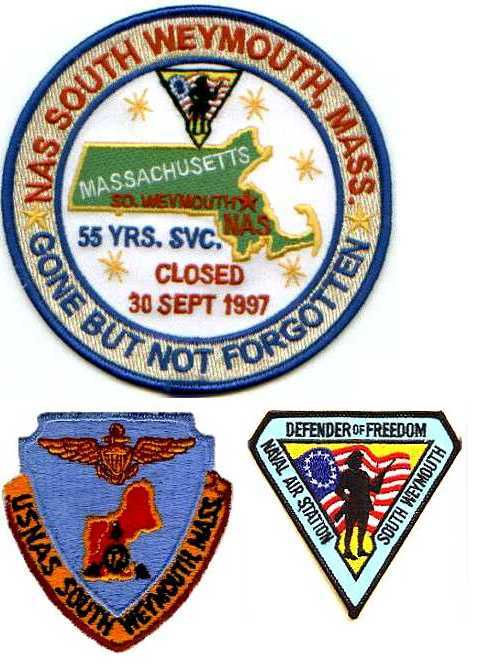 along with 2 other South Weymouth patches. The local government intended to redevelop South Weymouth, with no intention to keep the aviation facilities. A March 2003 photo by Ron Plante of the former entrance gate of NAS South Weymouth. A 2003 photo by Ron Plante of an A-4 Skyhawk mounted on a pylon South Weymouth. "Less than a mile past the gate is a display A-4 covered with looks like a base coat of paint. (Mel Shettle’s 'US Naval Air Stations of WWII, Vol I, Eastern States' has a 1993 photo with all the markings). Next to the A-4 are some benches & memorials. 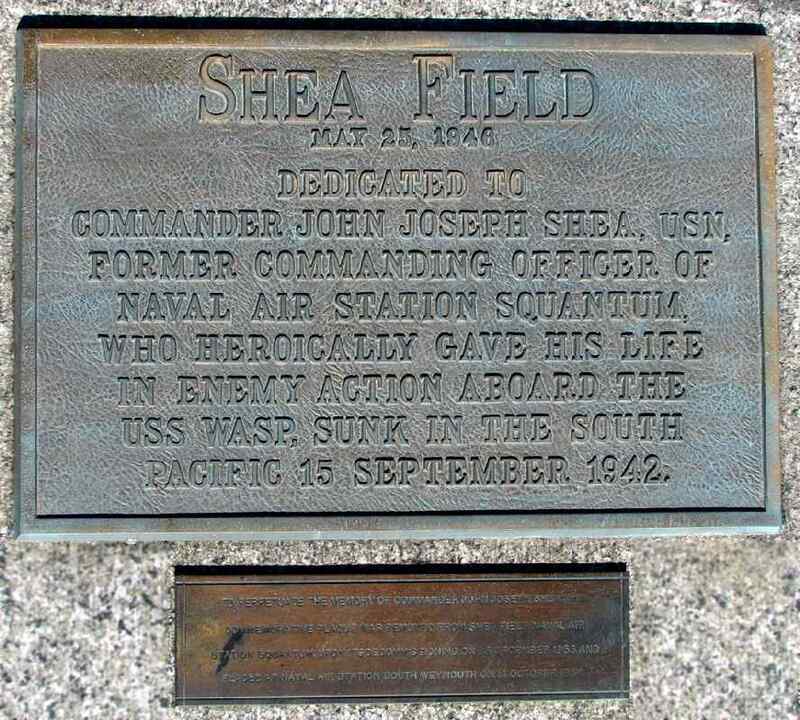 One plaque states that the name Shea Field was transferred from Squantum to South Weymouth." 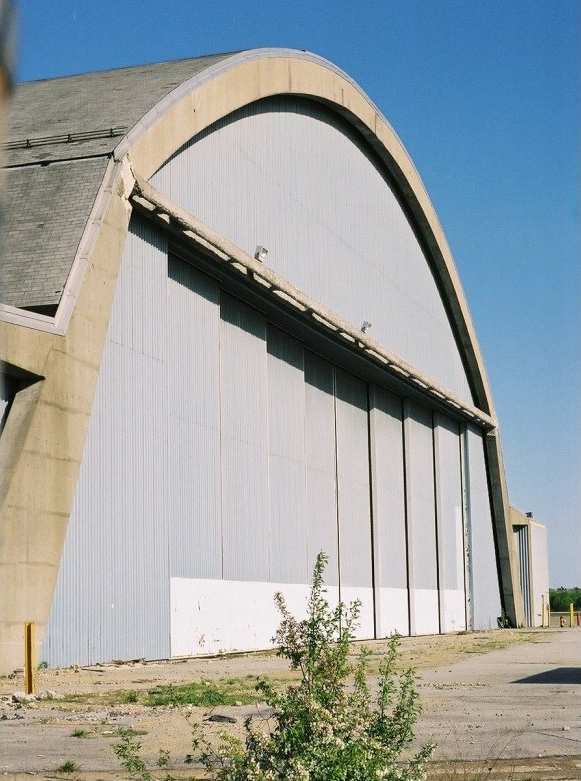 A 2003 photo by Ron Plante of an abandoned hangar on the northwest side of the South Weymouth ramp. Ron reported, “The flight line/hangar area is surrounded by a chain link fence, and the hangars look good. The blimp hangar door tracks can be seen in 2 of my photos in front of the concrete hangar [which was built on the site of the blimp hangar]. The remainder of the station is in pretty good shape, with no signs of vandalism. Some of the family housing is used by the Coast Guard. Although there are plans for extensive redevelopment, none was visible when I visited. 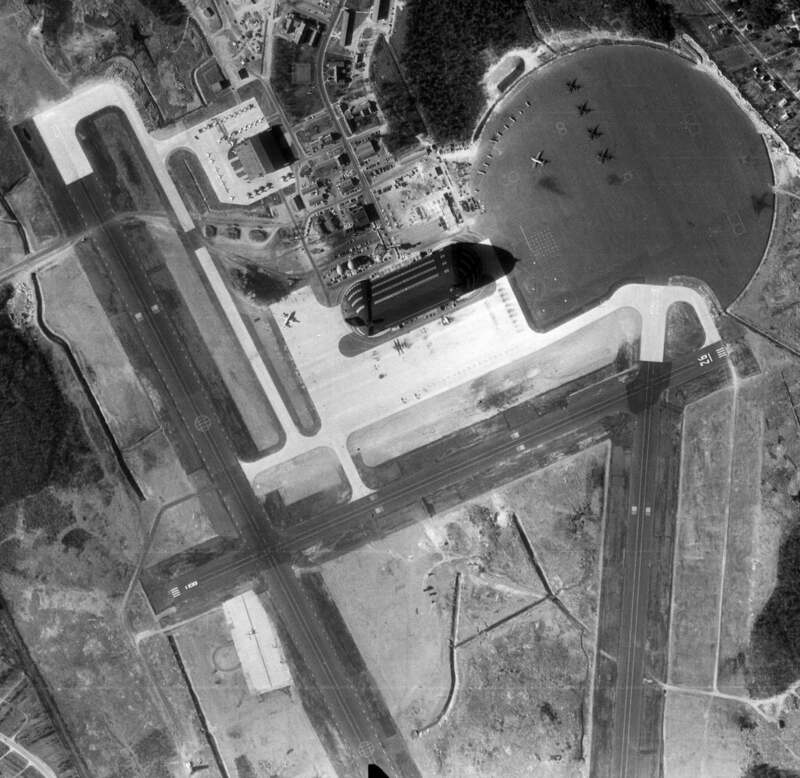 The station still has that spooky look of a functioning air base missing only aircraft & personnel." 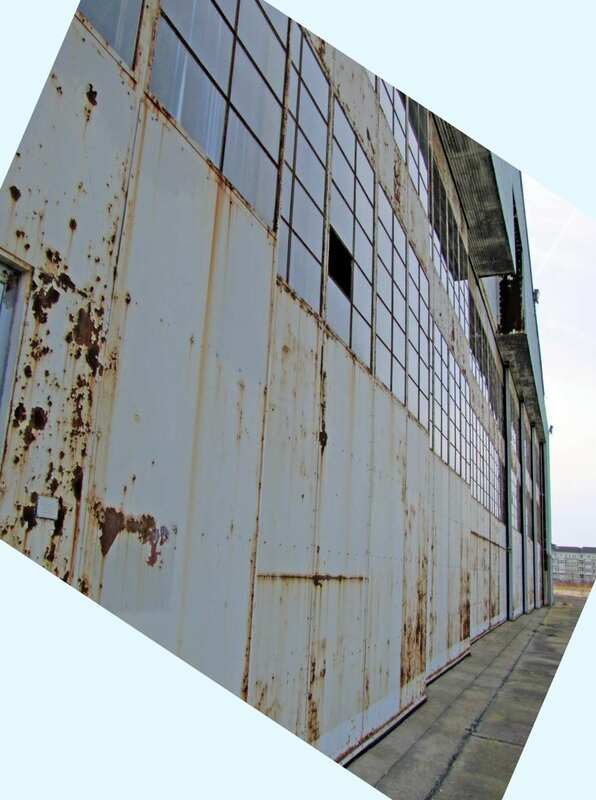 A 2003 photo by Ron Plante of another abandoned hangar at South Weymouth. right next to each other (one of which was built & never used). "Things are such a mess there right now that it will probably be several more years before a shovel hits the ground there." giving invited potential customers the chance to drive new cars in GM's lineup. An odd sight- a circa 2005 aerial photo looking north at the 2 unused control towers at South Weymouth. Couldn't these structures be relocated to airports that could use a control tower? A circa 2005 aerial photo looking north at the concrete arch-roof hangar which was built over the site of the former blimp hangar. A 2005 aerial view looking south at South Weymouth, showing the field remaining intact. A July 2005 aerial view by Suresh Atapattu looking north at the abandoned South Weymouth airfield. 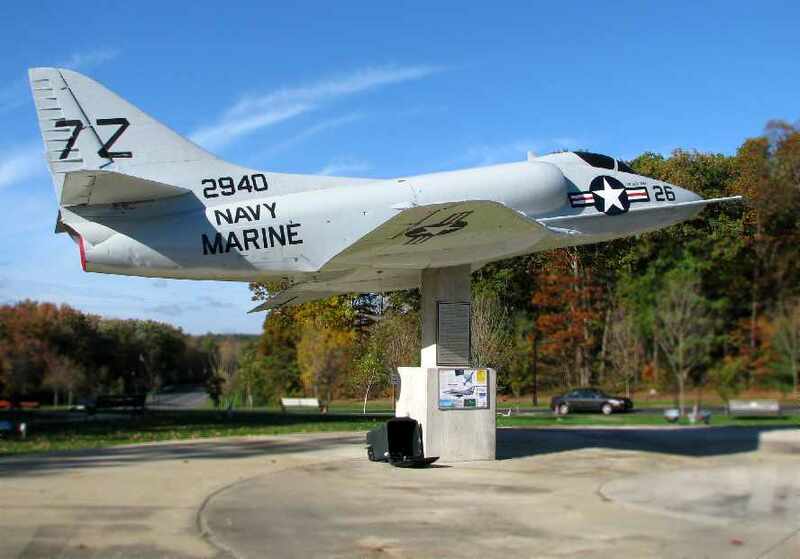 A 2007 photo by Steve Cohn of the “Renovated memorial to the Naval Air Station. A 2007 photo by Steve Cohn of the plaque at the memorial, describing the naming of the field as Shea Field. A 2007 photo by Steve Cohn of the “Old hangar 1 from the east through the fence. Note the tracks for the former blimp hangar in the foreground. before their transfer to NAS Brunswick, ME. Steve reported that there were “more than 100 construction vehicles on site. So far, construction is taking place away from the former flightline & former buildings. 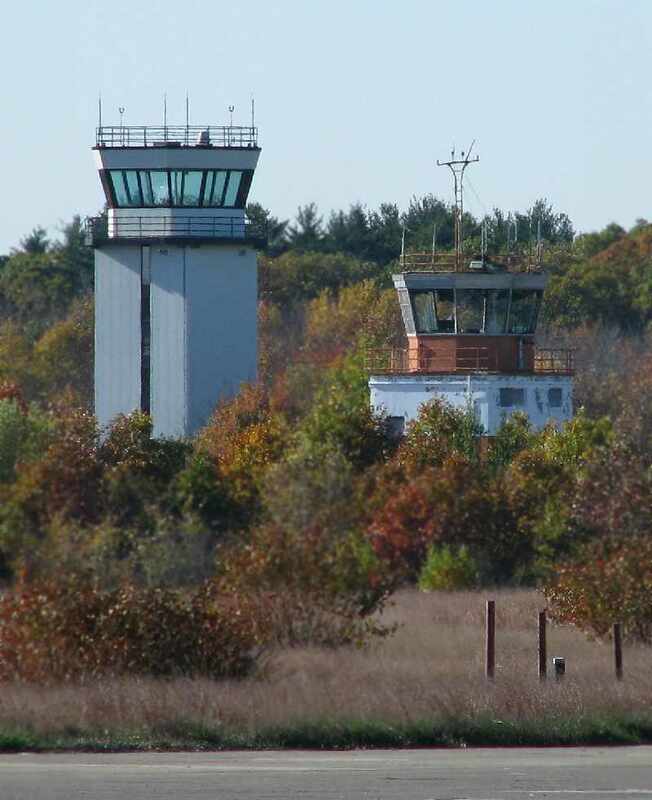 A 2007 photo by Steve Cohn of the odd sight of South Weymouth's 2 control towers: new & old. A 2008 aerial view by Steve Rose looking northeast at South Weymouth's hangars. Nearby resident John Bandzul reported in 2008, “There is not going to be a movie studio up there after all. LNR has bought just about 550 acres & the rest is still owned by the Navy. and they have an exclusive contract to sell the rest of the land to LNR. is expected to take about 12 years to complete at a total unknown price tag. Boston Approach is using it a VFR holding point at this time. Jay Epstein reported in 2008, “Today I took an advanced driving course at the old South Weymouth NAS. to wait for one of the employees of the driving school (In Control it was called) to open it up. It was kind of spooky just sitting there waiting in silence, looking at all the abandoned buildings & overgrown tarmac. If you closed your eyes you could almost hear the roar of fighter jets long since departed. After a while one of the guys came and let me & about 7 cars in the gate. We followed the employee over to a taxiway that connected to the former Runway 8/26. There we did all sorts of fun emergency maneuvers on Runway 8/26. It was very cool driving around on the old, overgrown runway. Most of the buildings seemed to be in decent condition despite their age & probable lack of maintenance. went off in one of the old buildings so now it's covered in foam. He also said that they weren't allowed to have running water due to all the old nasty stuff in the ground. The gate complex is now completely gone. 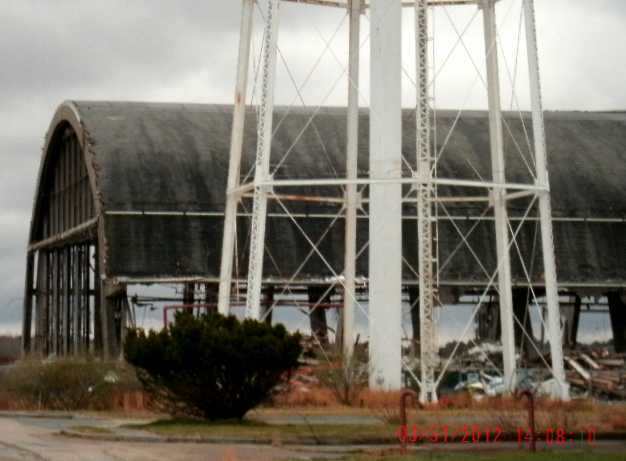 An April 2008 photo by Chris Gatto of the South Weymouth water tower with a hangar in the background. 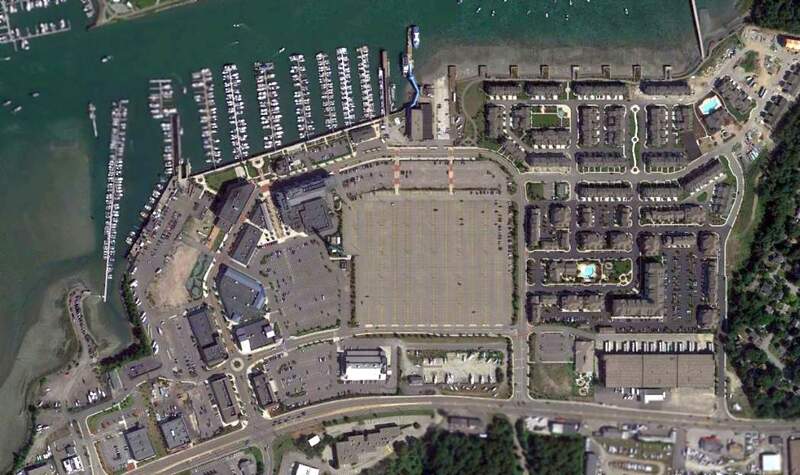 although condos were being built adjacent to the former South Weymouth runways. “looking west from the east mat landing area)”, of “the start of the demolition of ( HTA) Hangar One at South Weymouth. 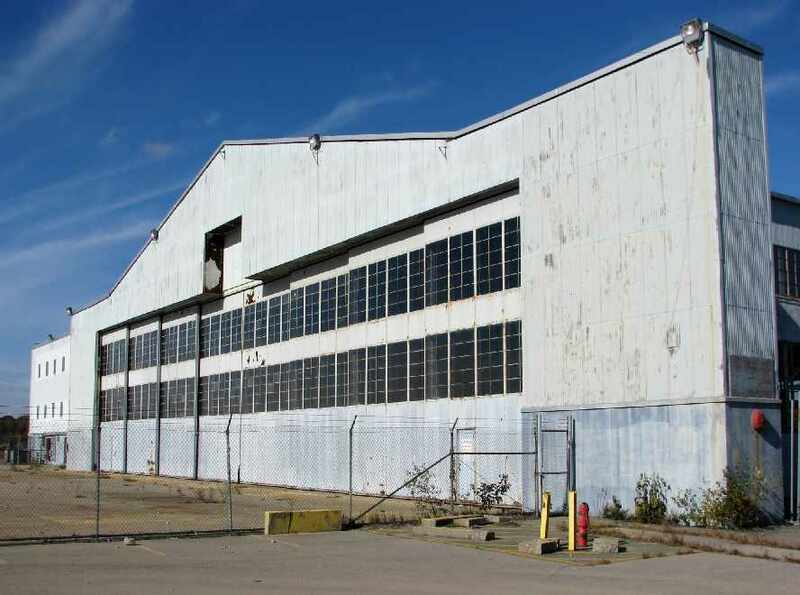 A 3/31/12 photo by Clyde Ramsdell showing Hangar 1 in the process of being demolished. 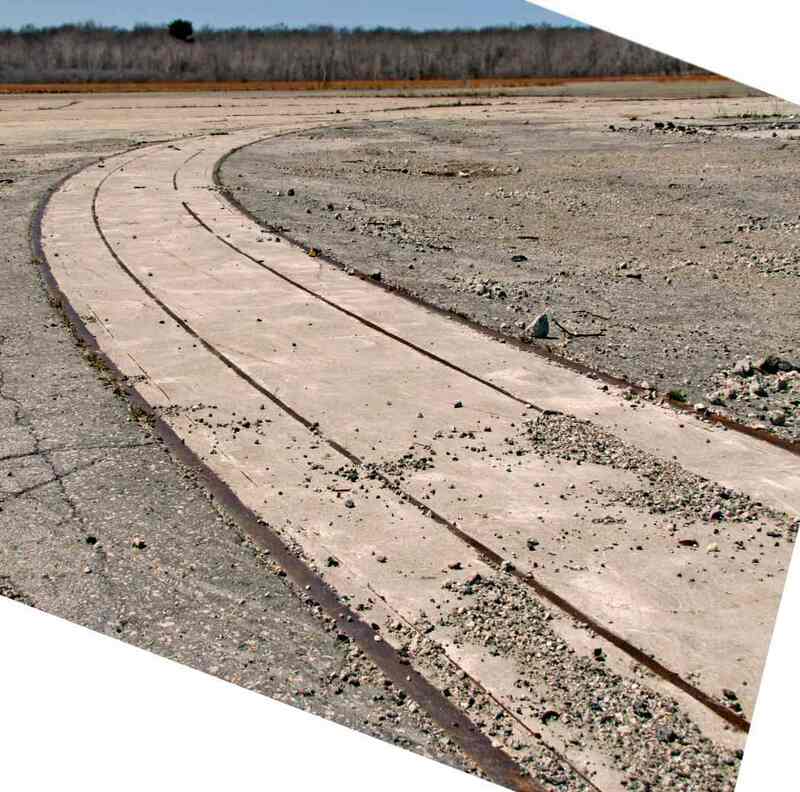 A 4/5/13 photo by Marc Senger of the curved hangar door tracks that remain from South Weymouth's massive Hangar 1. 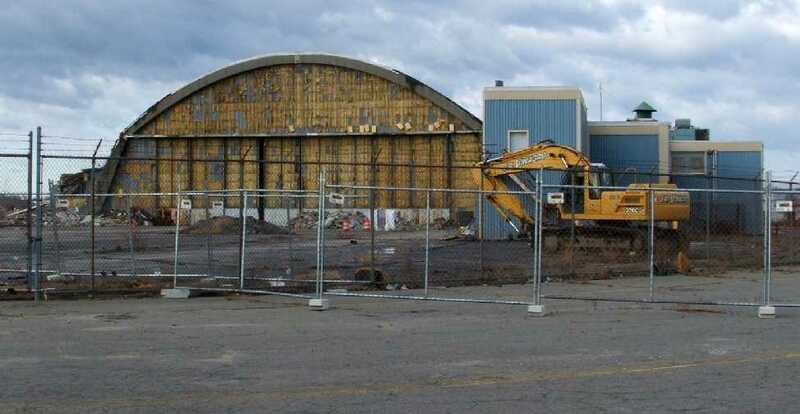 A 4/5/13 photo by Marc Senger of South Weymouth's former Hangar #2. A 4/5/13 photo by Marc Senger of the older of South Weymouth's 2 control towers. A sad 6/10/15 aerial view by Graeme Smith looking east at the remains of NAS South Weymouth, showing the newly-built road cutting wastefully across the runway & ramp. 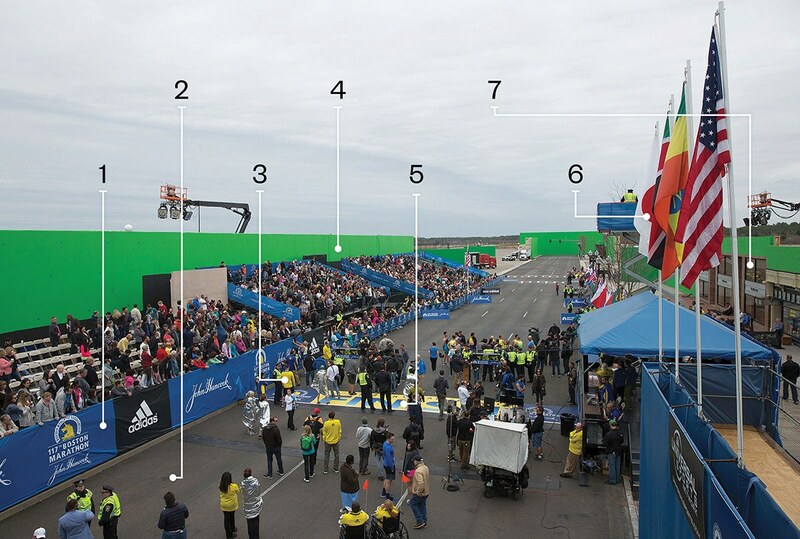 A February 2016 photo annotated by Graeme Smith of the movie set constructed on the NAS South Weymouth property for the movie “Patriots Day”. Graeme observed, “It was originally envisaged that after the airfield closed, a movie & sound stage complex would be built. It never happened. But... The 'finish line' set was created on the airfield using 50 carpenters & about 20 painters. 1. All of the banners & graphics were printed to match the style of the 2013 marathon. so the filmmakers could use the real bleachers, grandstands, photo bridge, and other pieces for the movie. 7. To re-create the brick LensCrafters building, now an AT&T store, the crew built the upper story to match how it looked three & a half years ago. A 2016 aerial view looking south at the remains of NAS South Weymouth, showing development encroaching on the former airfield.